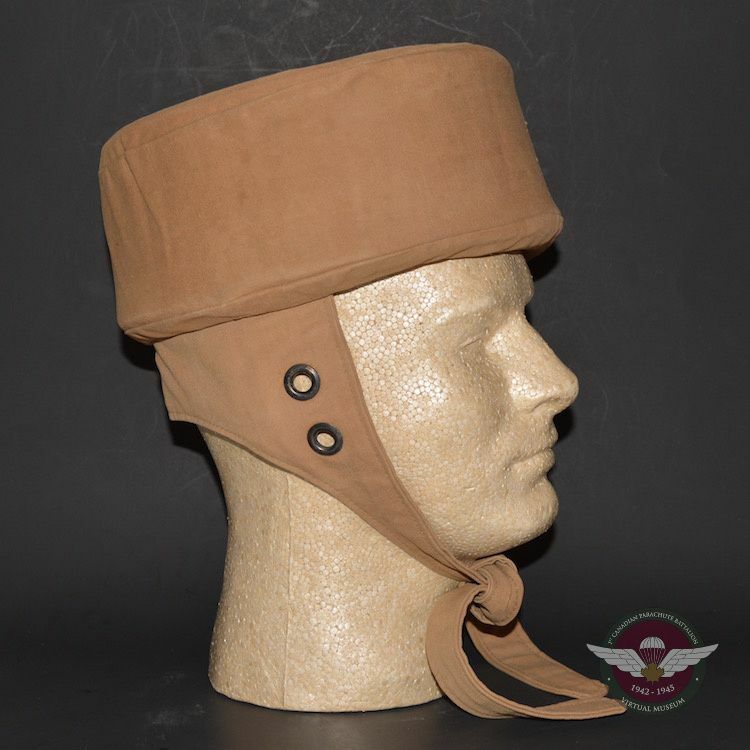 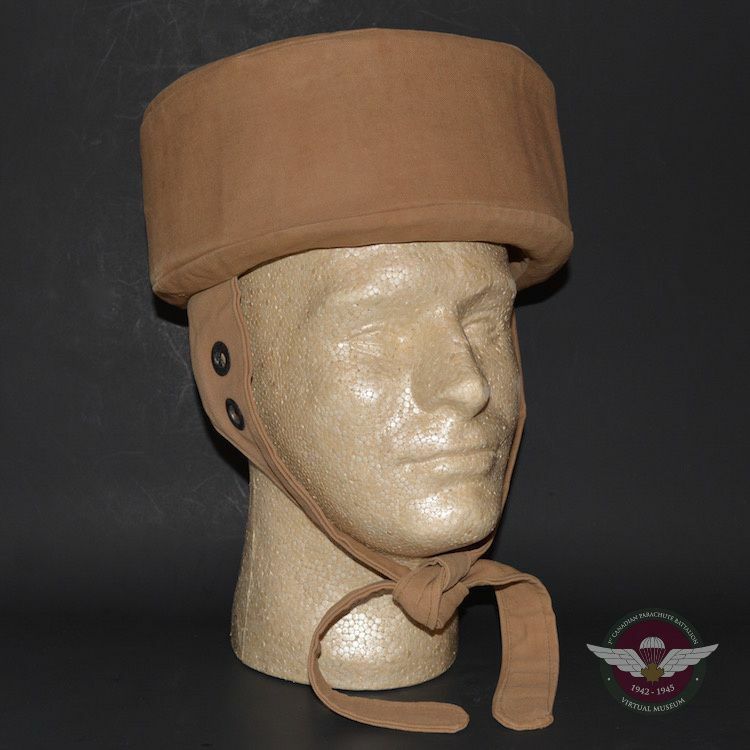 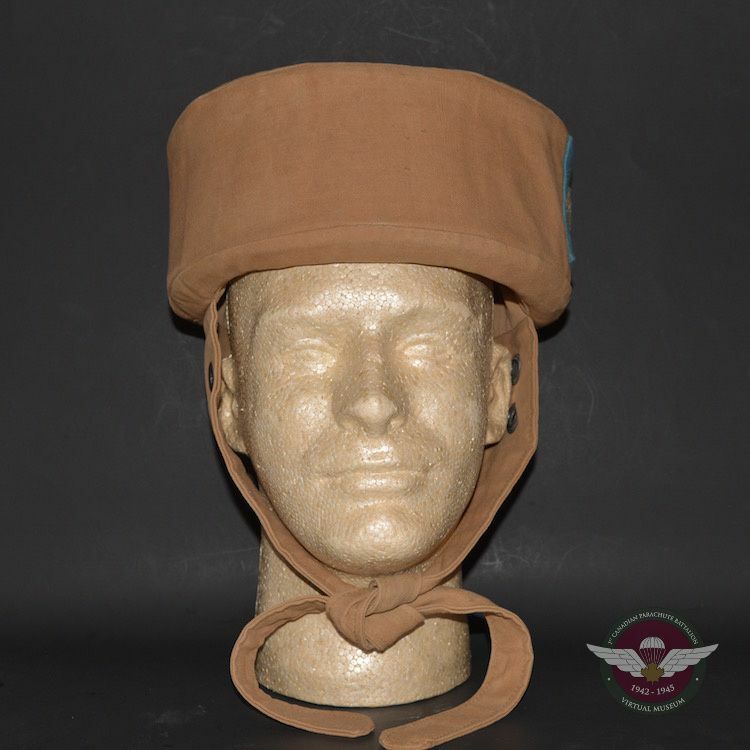 This Paratrooper training helmet was used at Ringway, U.K by the students who attended the parachute school. 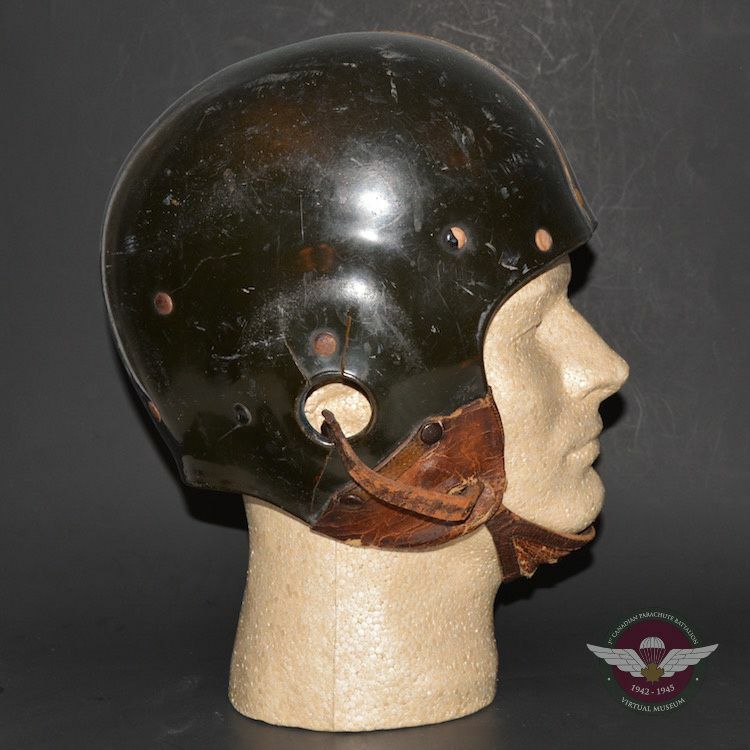 You will often hear this helmet referred to as a bungee helmet. 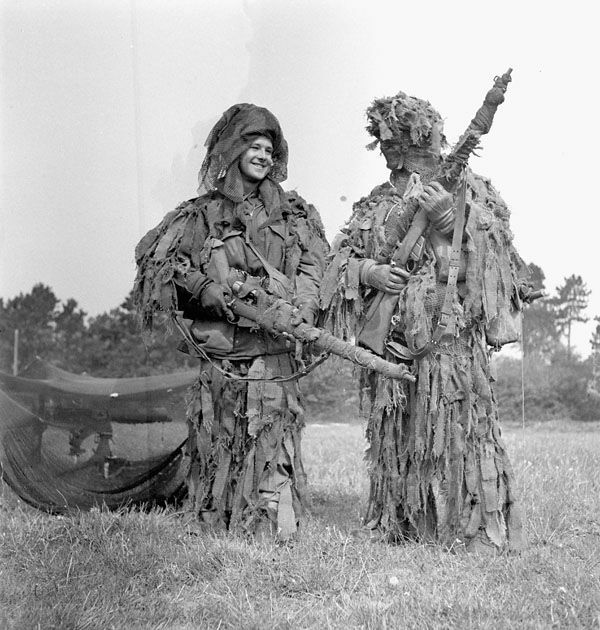 There were a few variations produced, all being constructed of a light canvas material wrapped around a sponge liner. 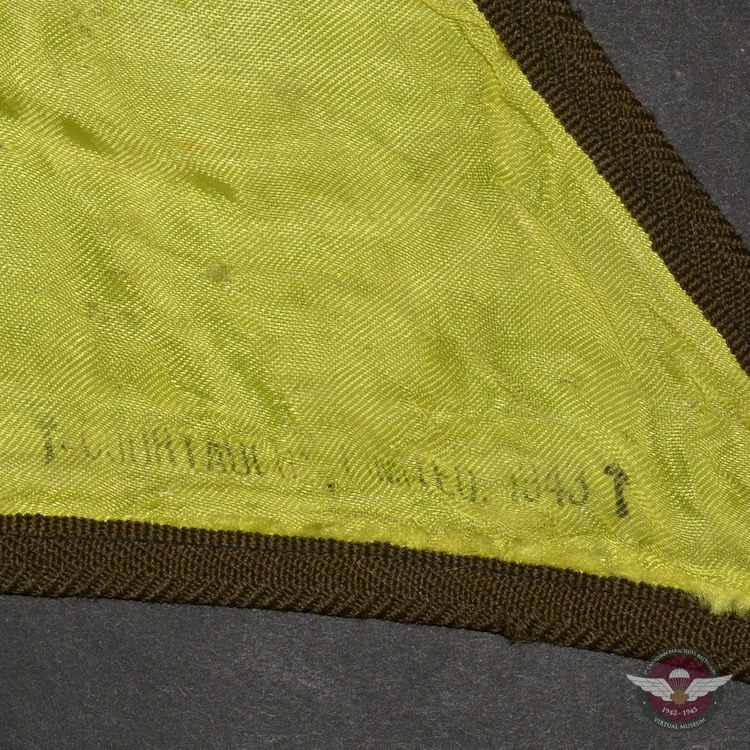 The British X-type troop parachute was a highly successful design resulting from the cooperation of two competing firms, GQ and Irvin Air Chutes. 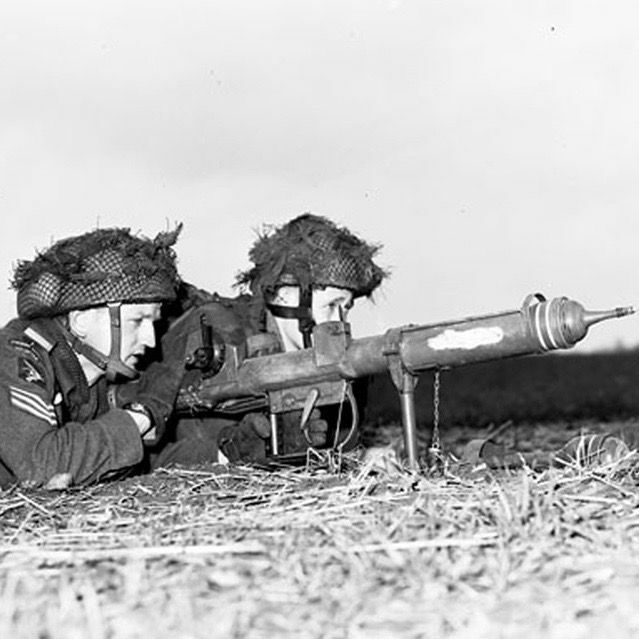 Adopted late in 1940 as the MkI (15A/475), it continued in service with several modifications through the end of the war. 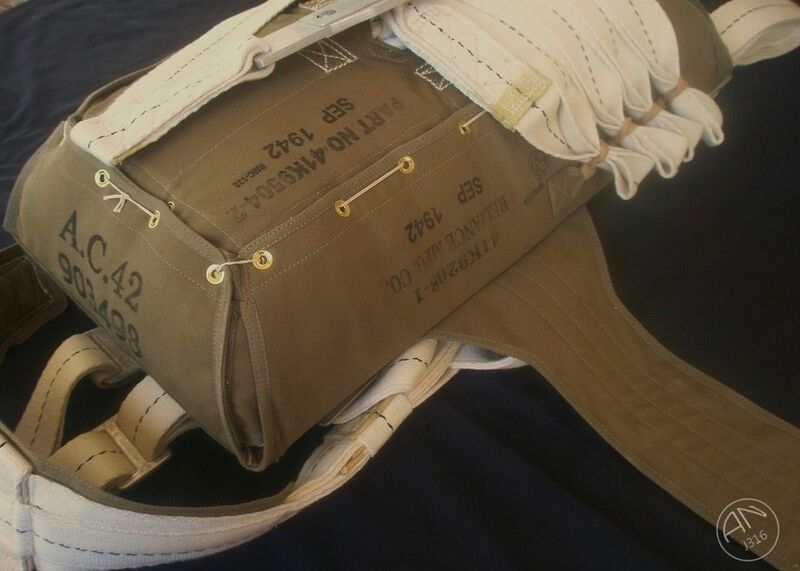 Unlike US parachutes, the X-type did not have a reserve parachute, but instead was provided with an internal deployment bag. 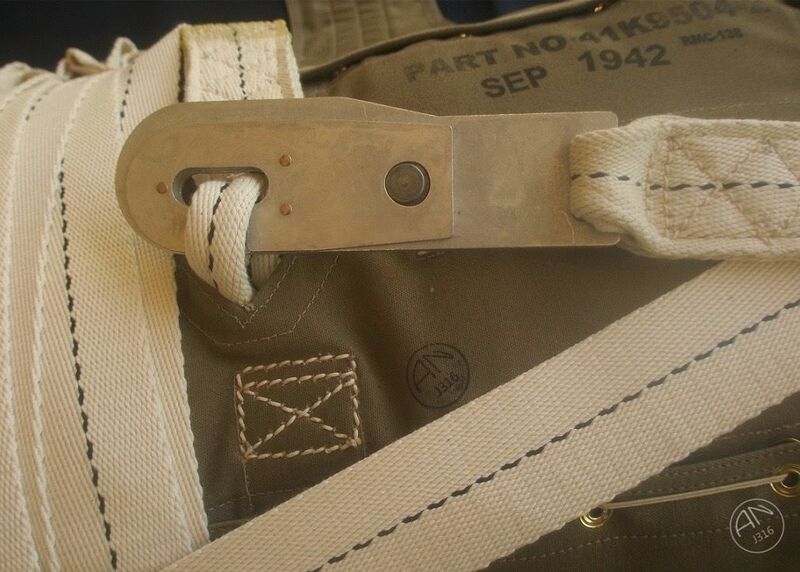 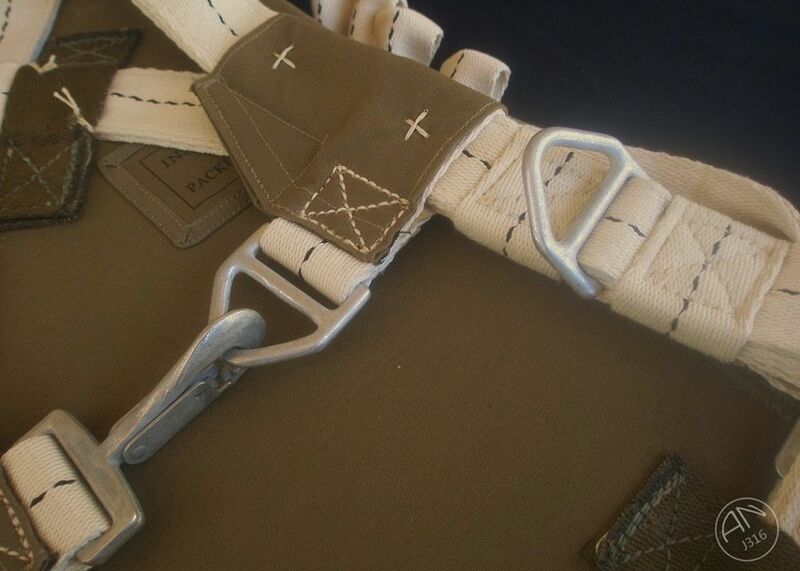 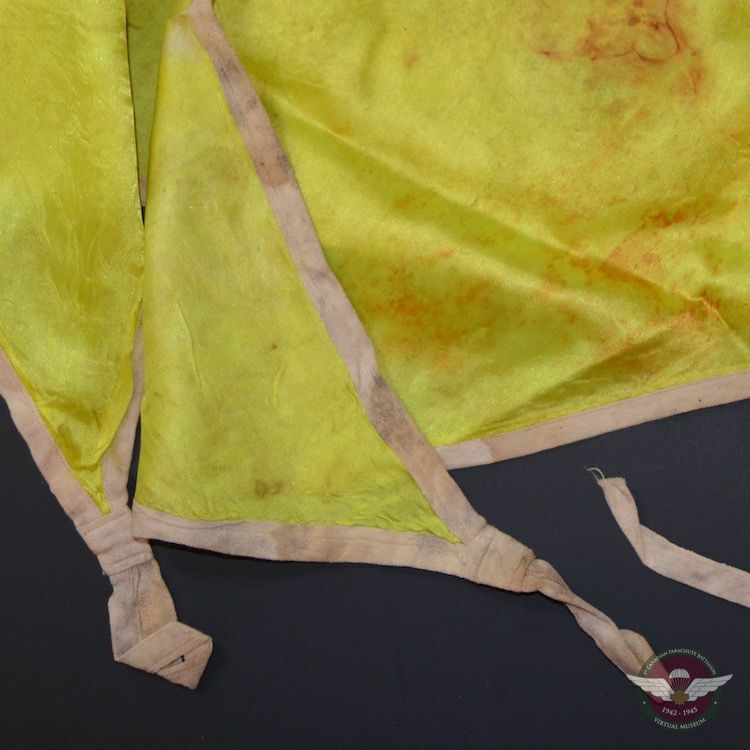 The original MkI pattern is identified by the external static line stowage under two vertical pockets, and bungee loops for suspension lines hidden inside the deployment bag. 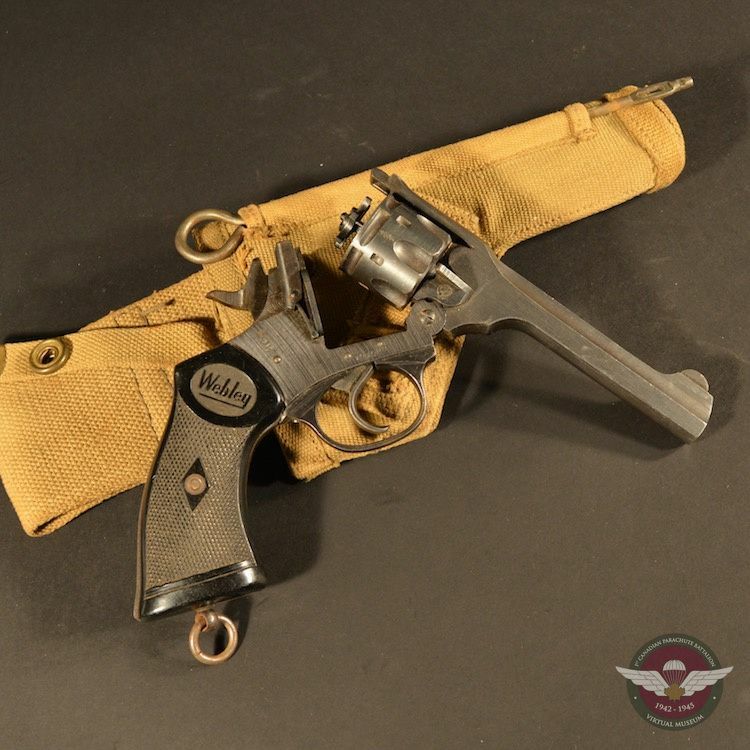 Although slowly phased out by the MkII beginning in 1944, the original MkI continued in use throughout the war. 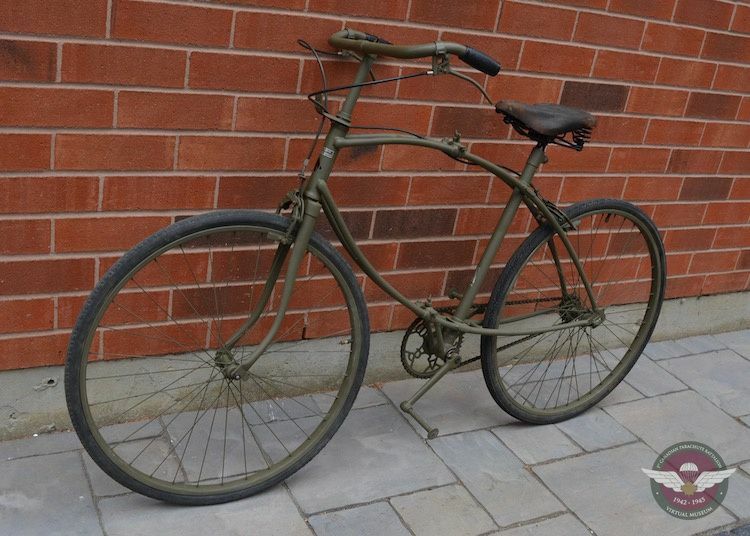 Ideal for 1940 through Normandy. 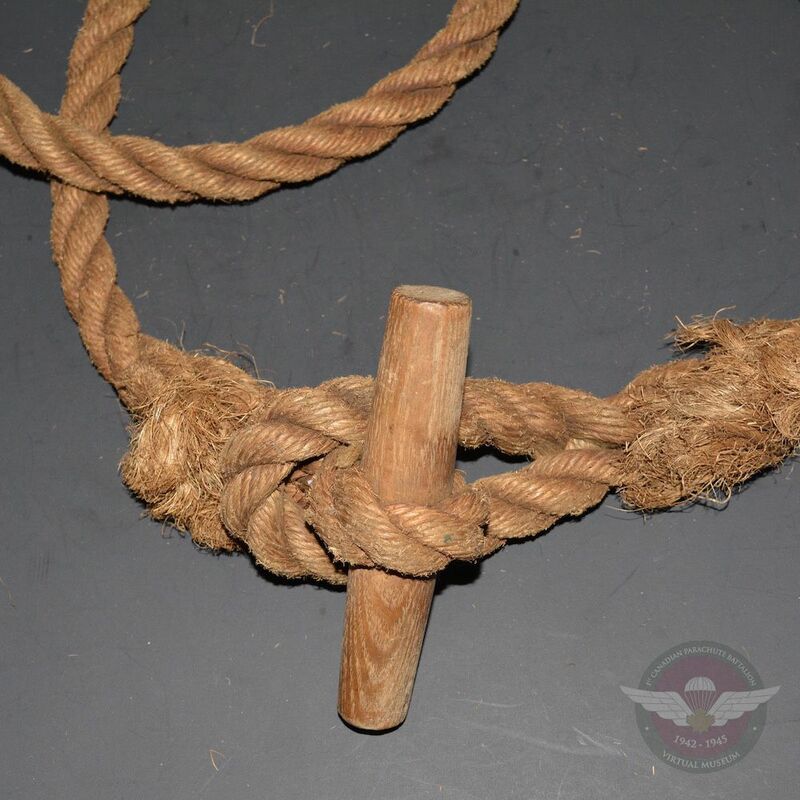 Photographs and information courtesy of Joshua DeJong, from The Rigger Depot. 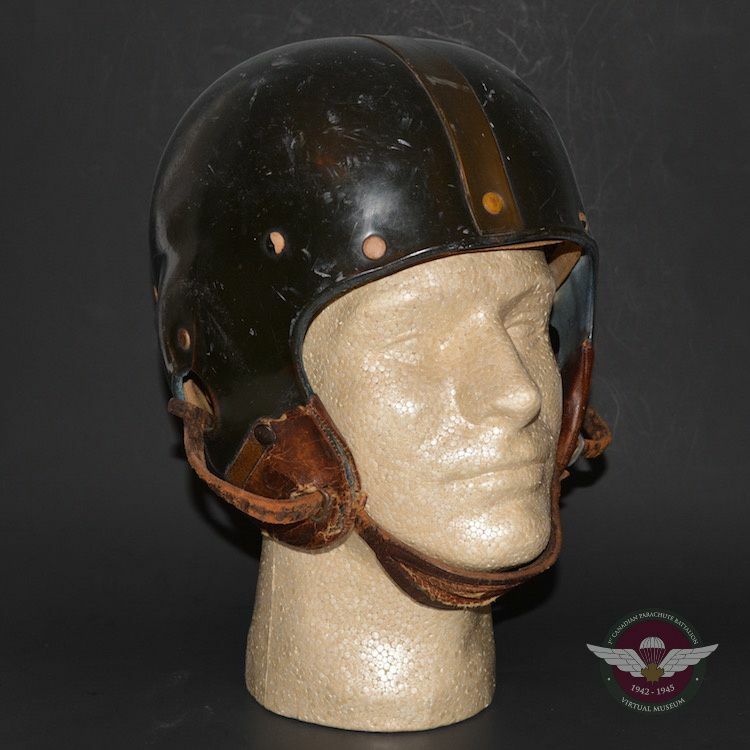 This Riddell football helmet was standard issue to students attending Fort Benning, Georgia for paratrooper training. 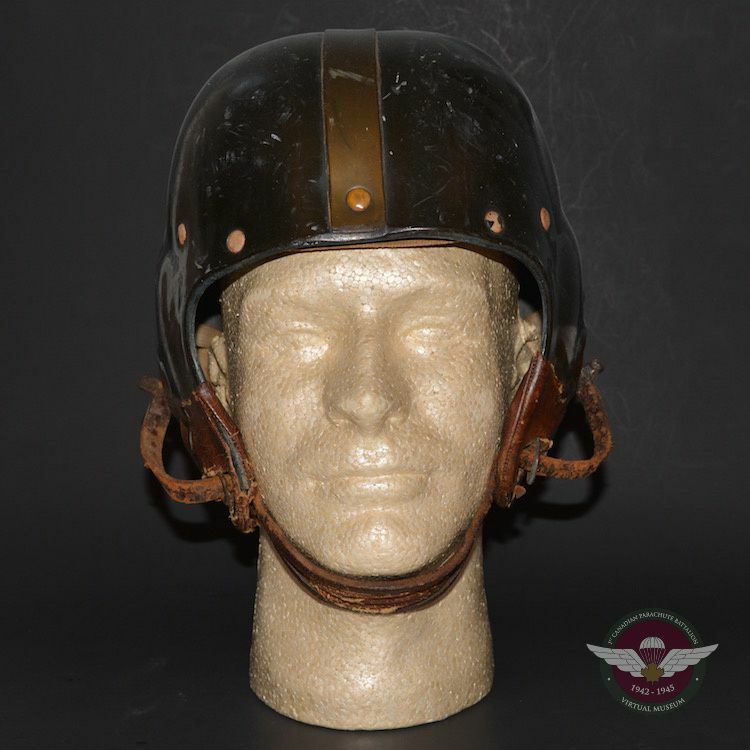 Canada adopted the same helmet to be used at Shilo, Manitoba when the school was opened. 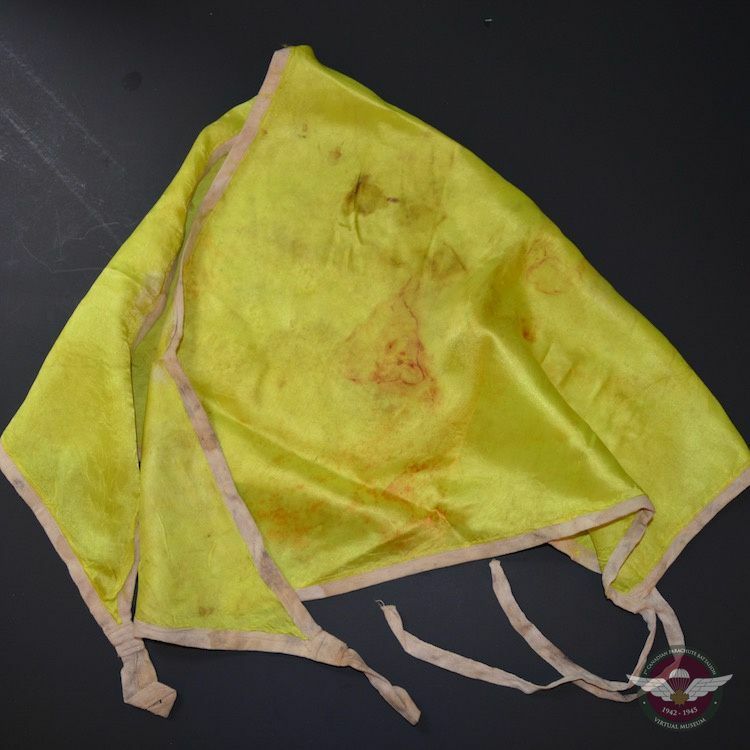 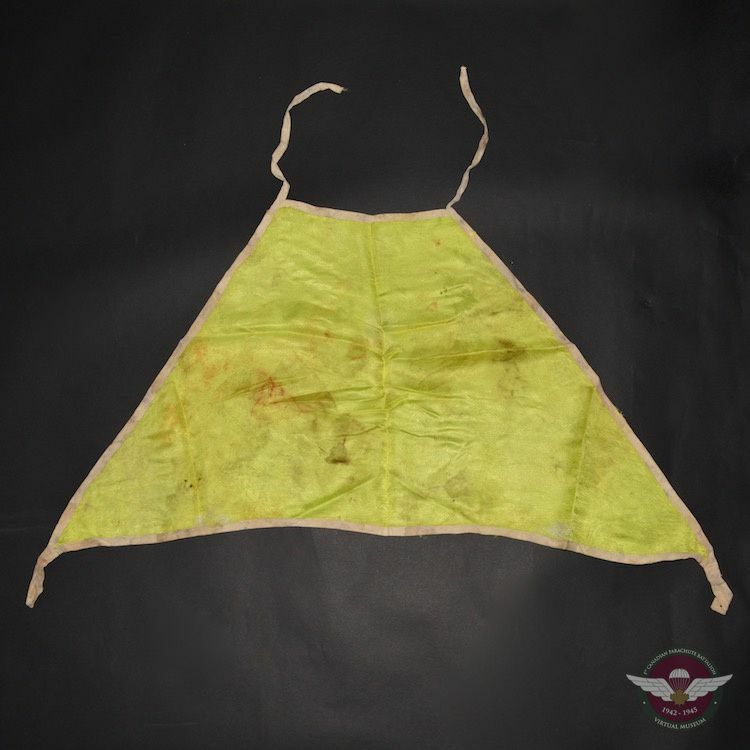 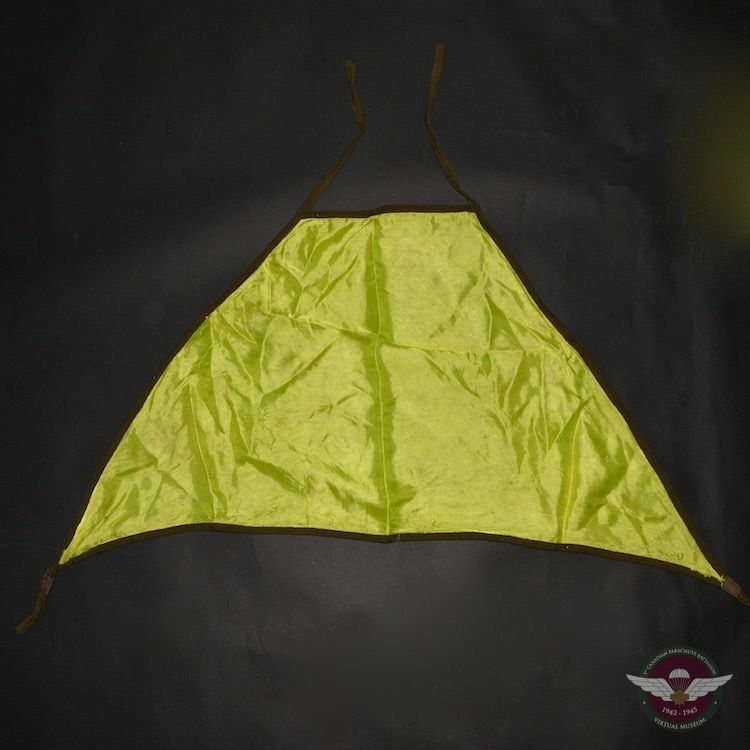 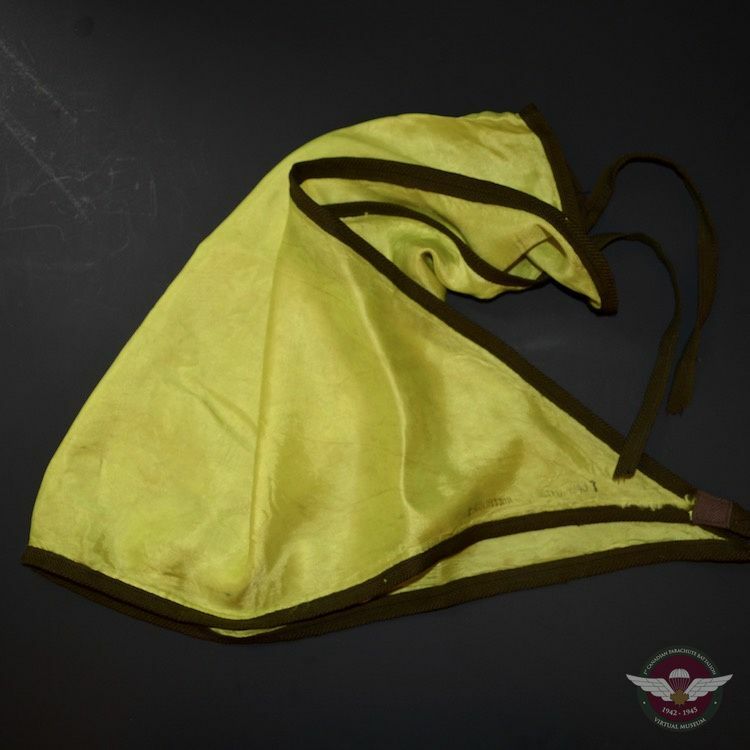 The T-5 parachute was standardized June 1941, many of these first pattern chutes were used in all theaters of action. 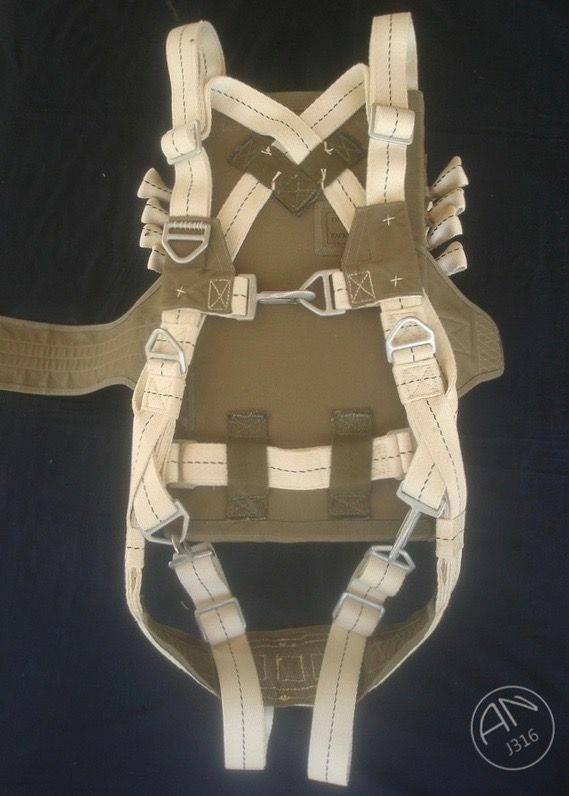 They saw extensive use in training at Fort Benning, Georgia, USA. 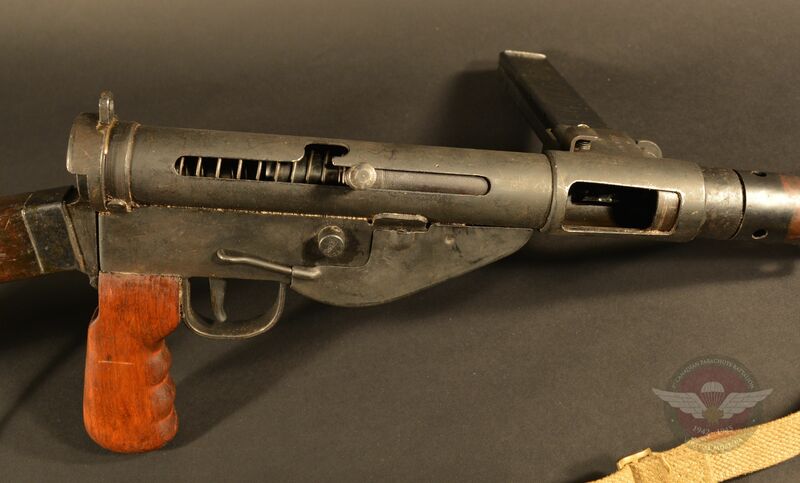 The white T-5 remained standard throughout the war. 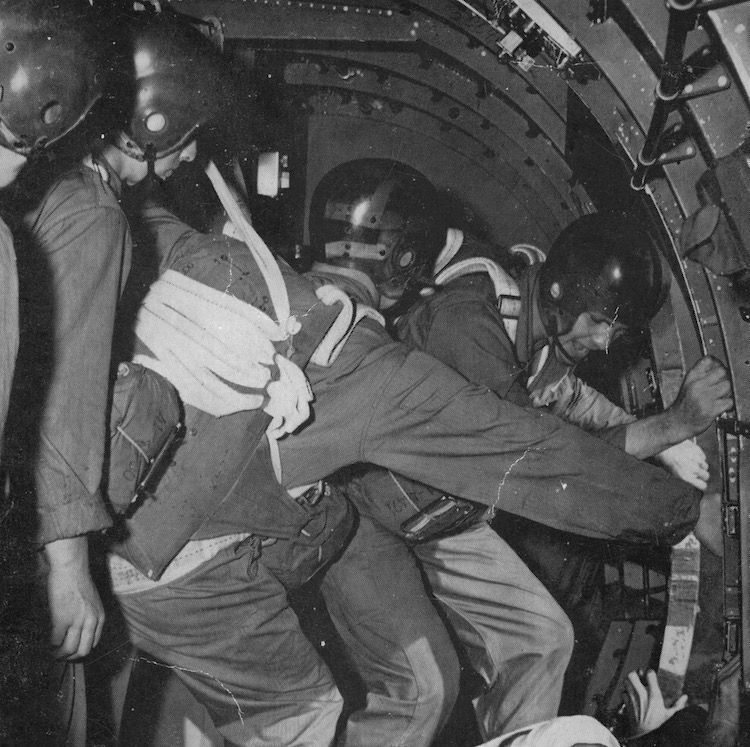 First pattern harnesses were equipped with cadmium plated hardware and 2,500-pound V-rings for reserve attachment. 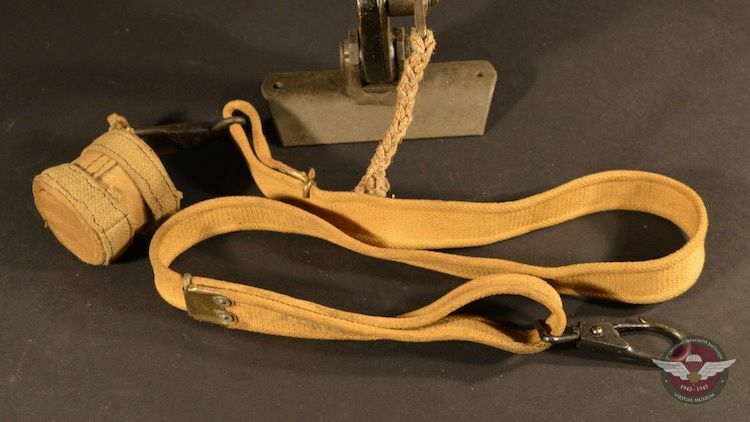 By 1943 white harnesses were manufactured with the larger 5,000-pound D-rings, but this was a short-lived as the camouflaged units were introduced in the 2nd quarter 1943. 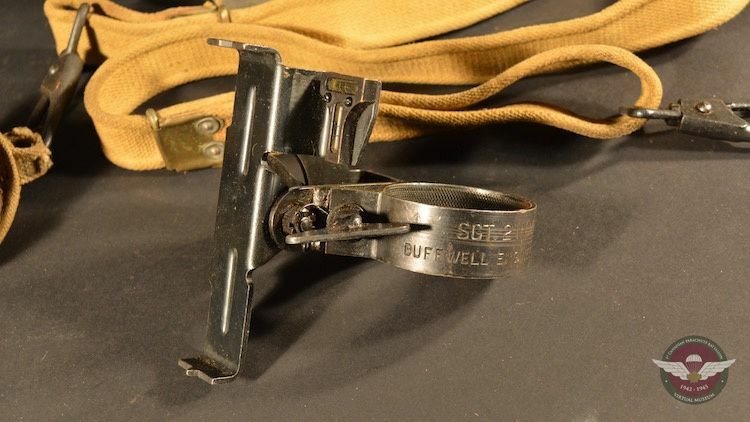 The simple snap hook with the locking pin was common on the initial rigs, but by early 1942 they were replaced by the large sliding gate "humpback" fastener. 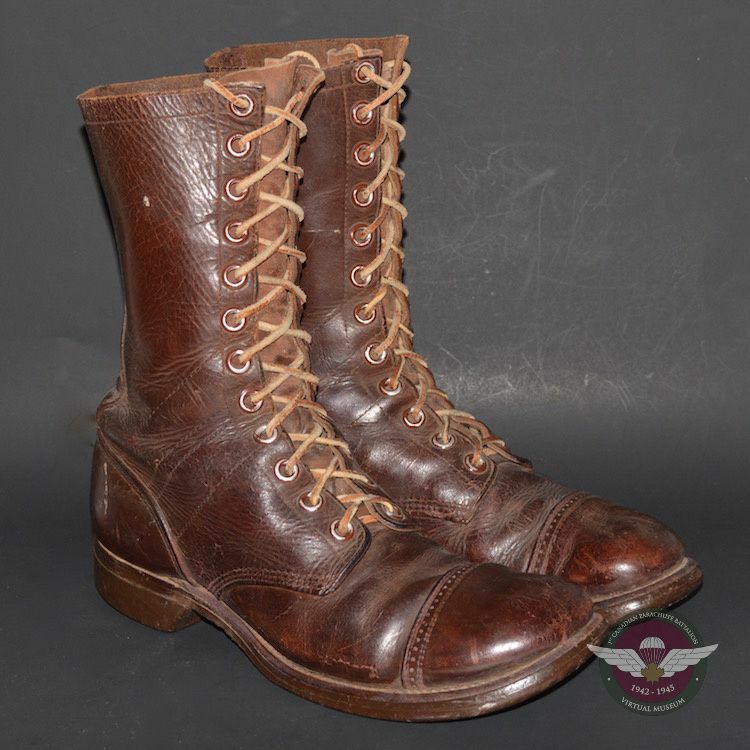 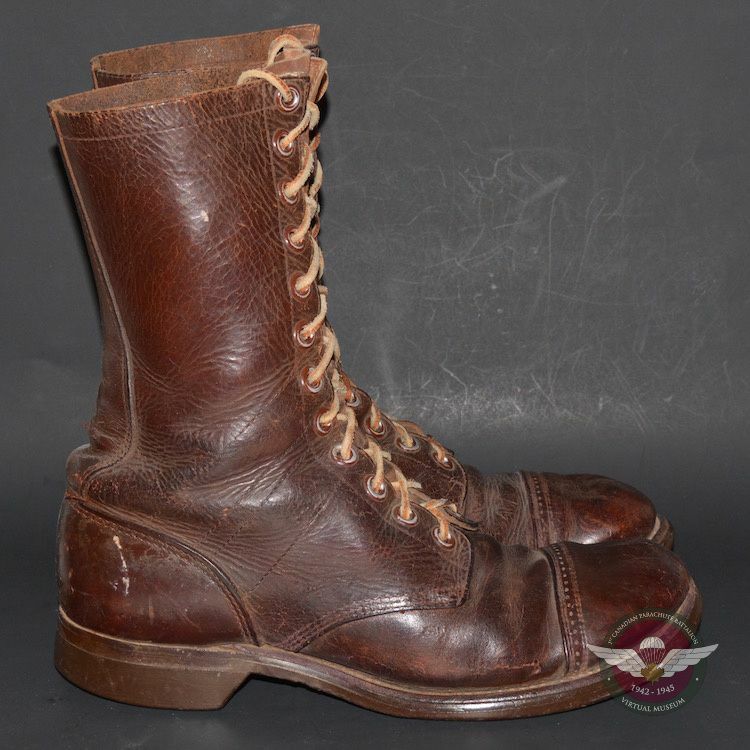 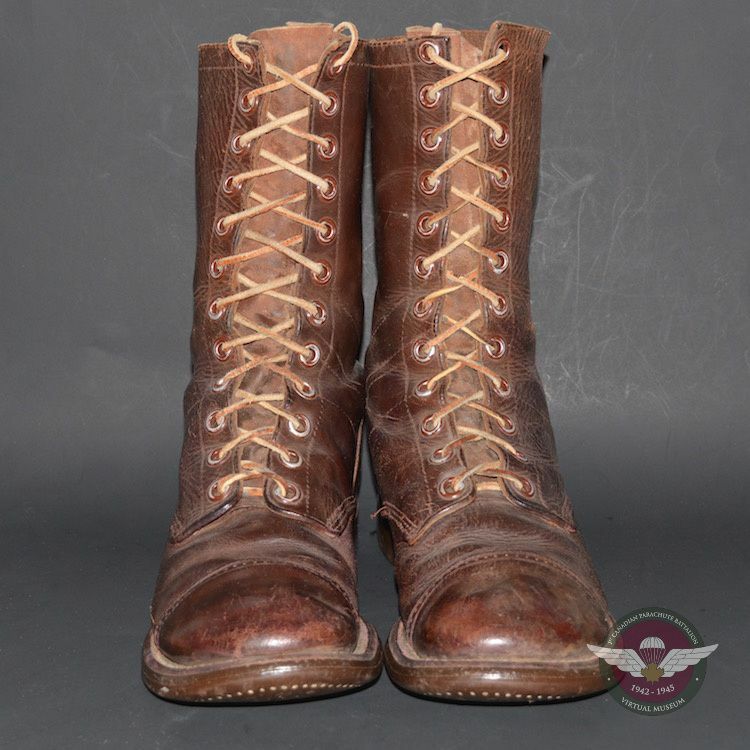 These sharp looking U.S. Paratrooper boots were admired by the Canadian's who received their training at Fort Benning. 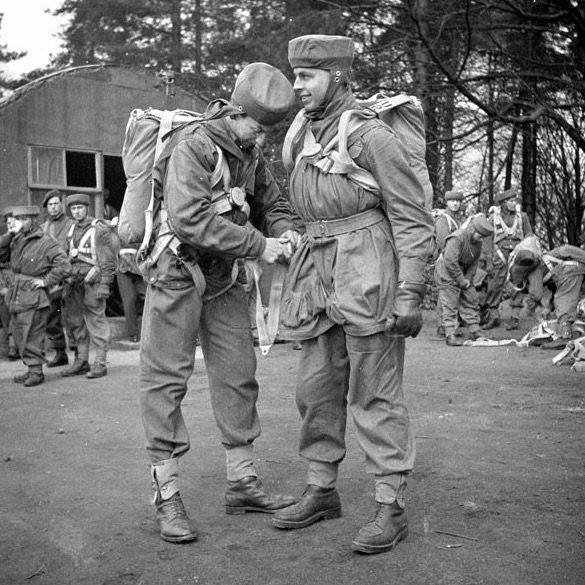 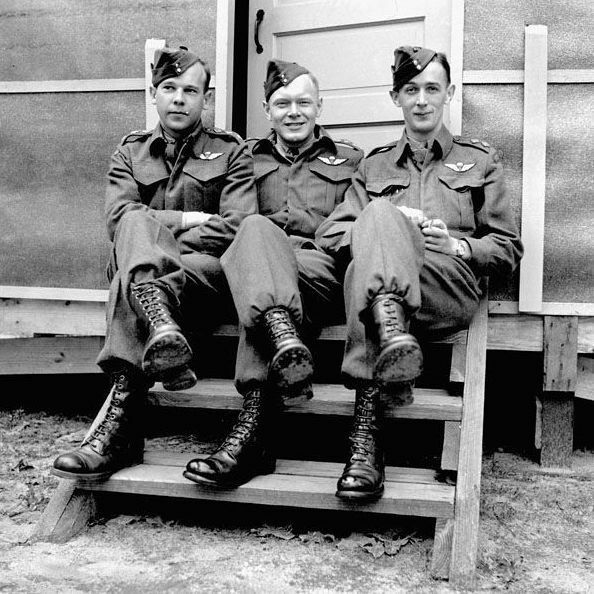 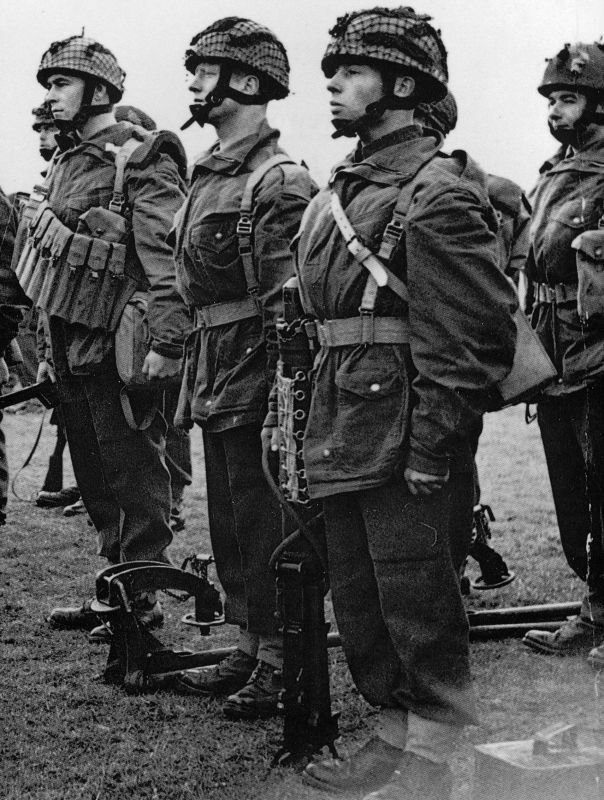 Many Canadian Paratroopers adopted a set for themselves. 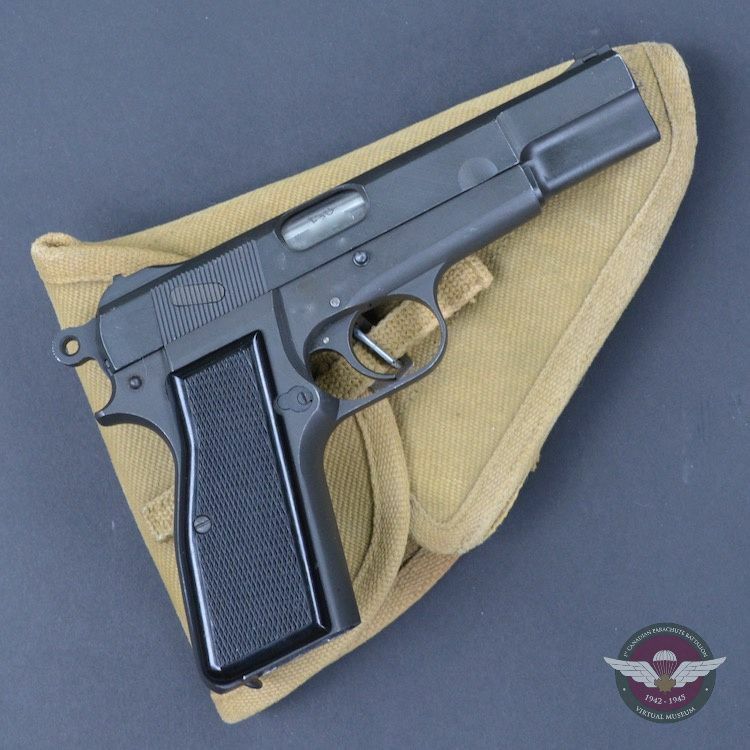 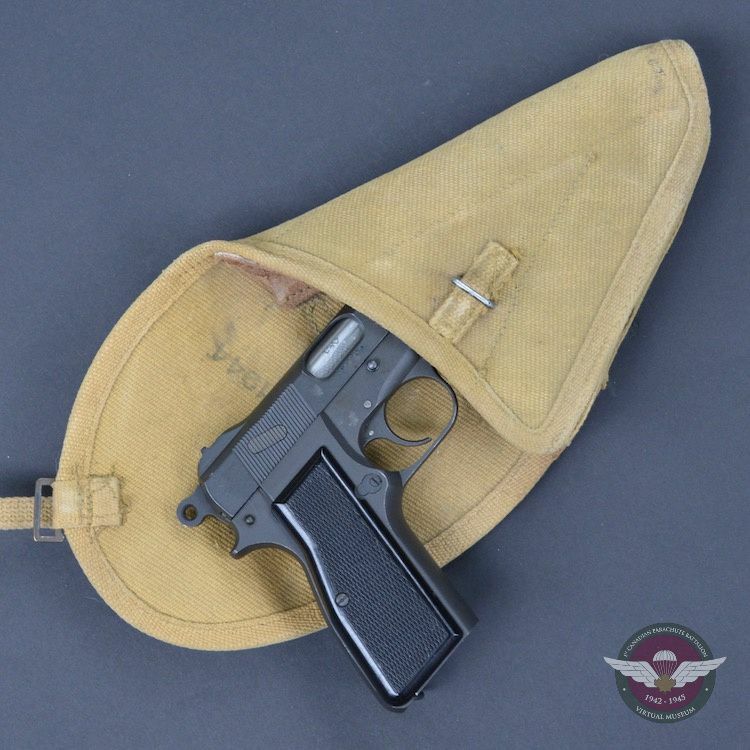 The Browning Hi-Power 9mm semi-automatic pistol was durable, introducing high capacity magazines holding 13 rounds, allowing for faster reloading than the traditional revolver. 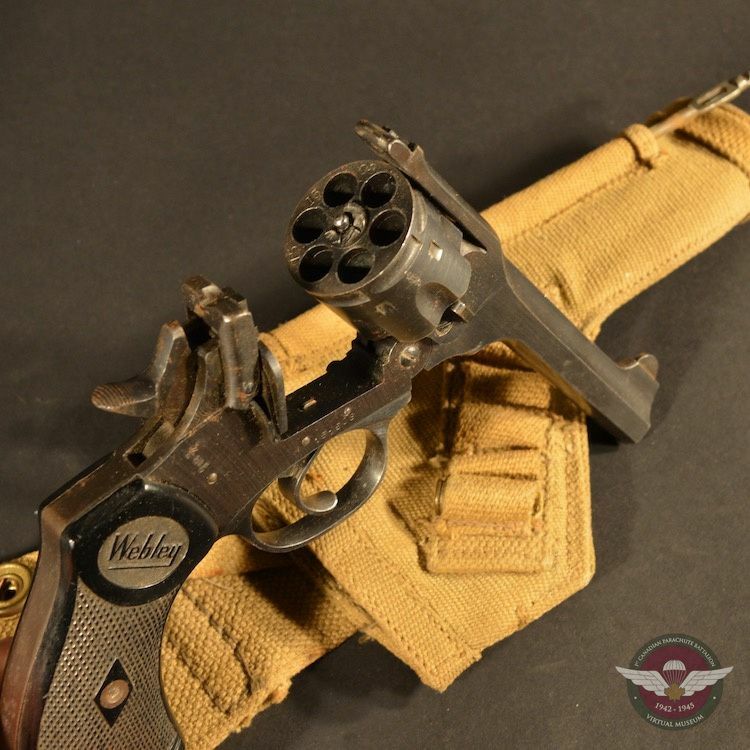 The maximum effective range in the hands of a skilled shooter would be 50 yards. 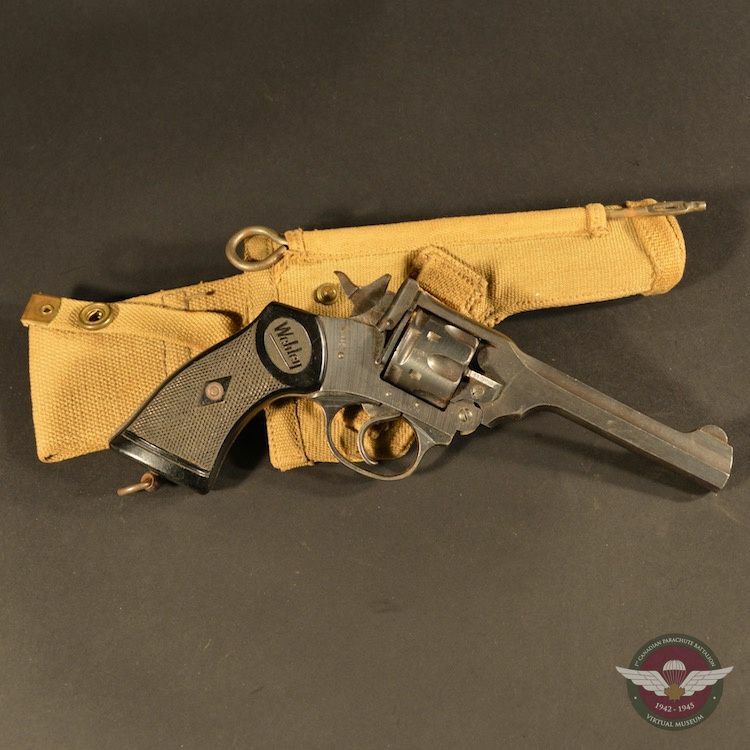 The Webley revolver was issued for personal protection with an effective range of 50 yards in the hands of a skilled shooter. 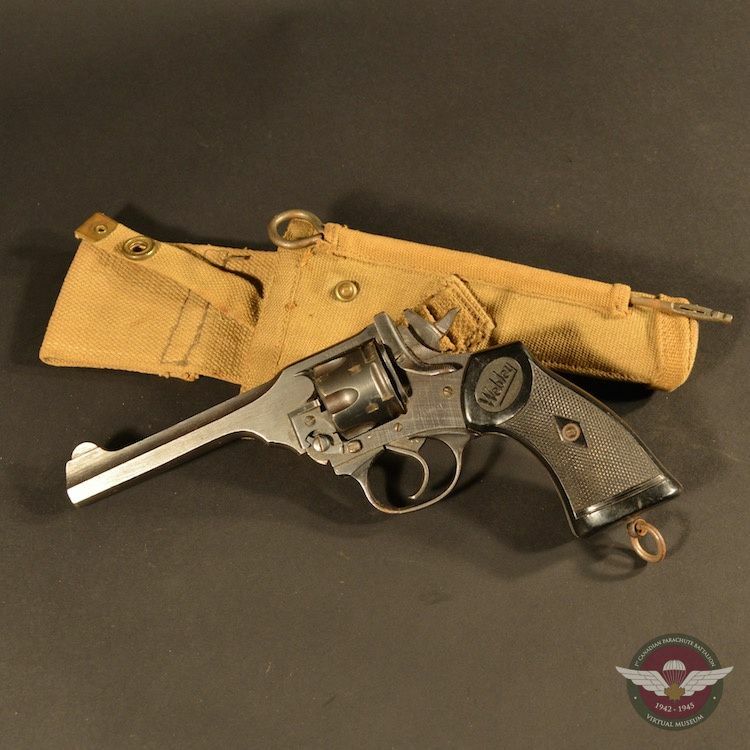 The revolver was 2.4 pounds, with a 6 round capacity of .455 calibre cartridges. 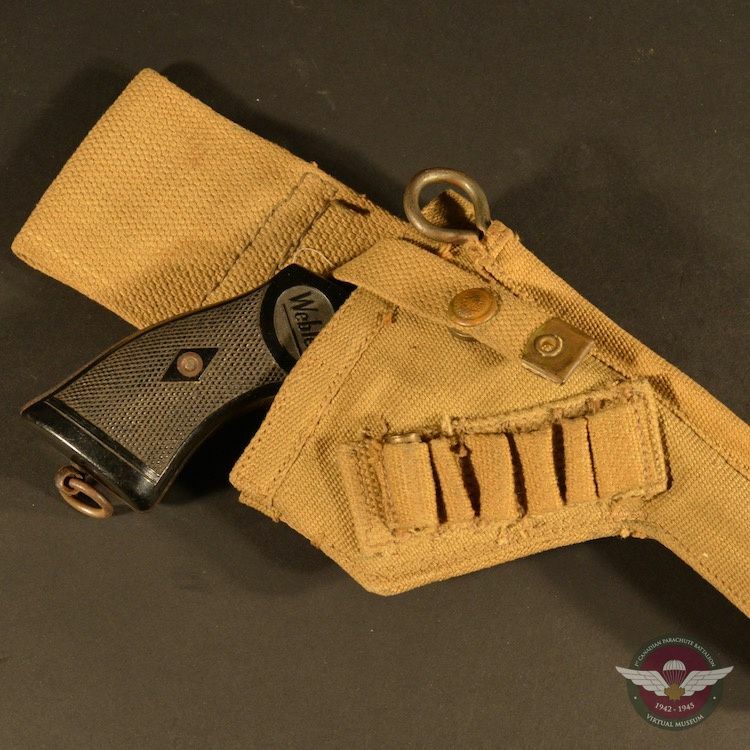 This firearm has a lanyard ring to allow it to be tethered to the person to prevent loss. 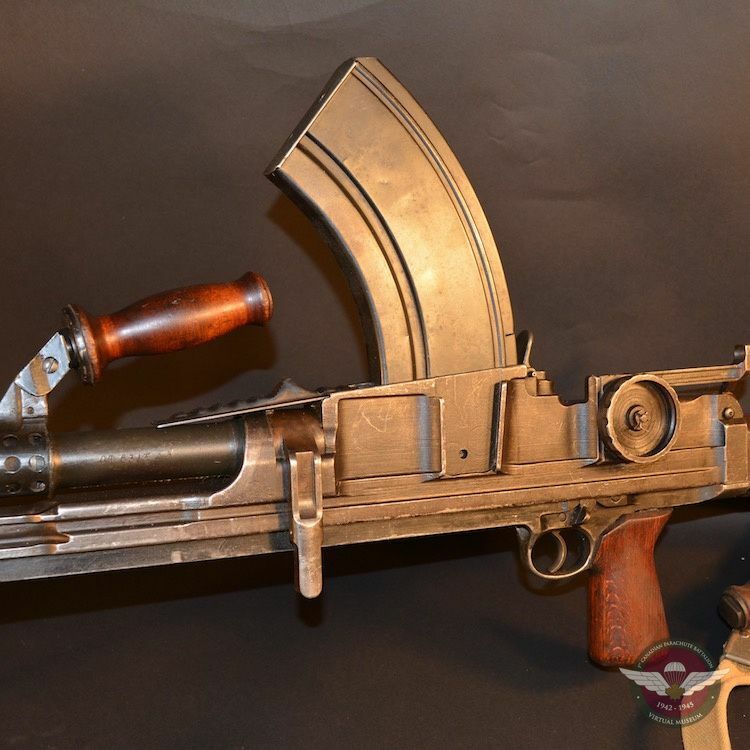 Courtesy of Collectors Source. 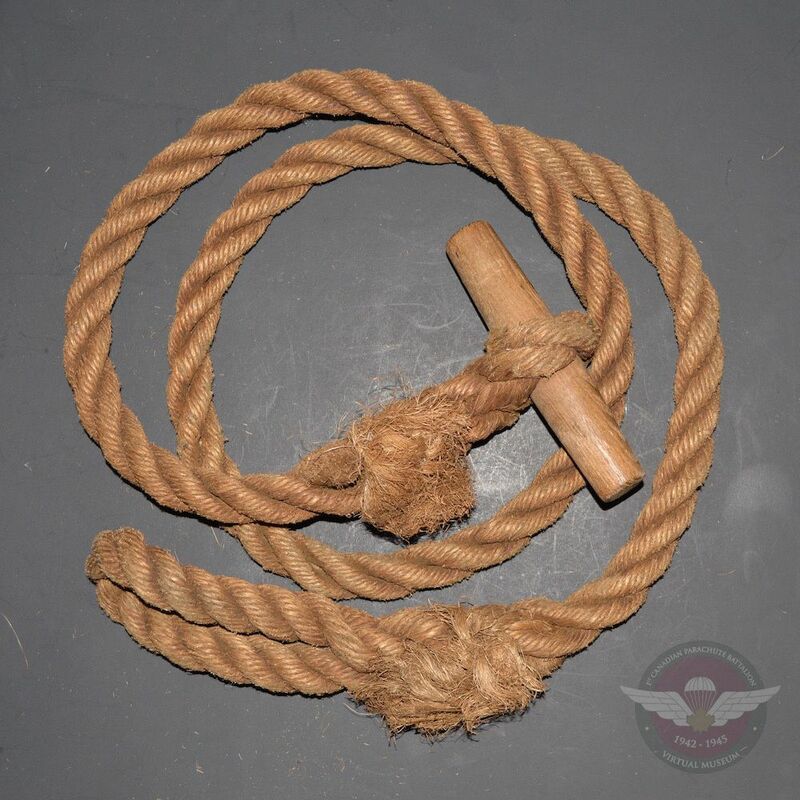 The 6” toggle rope was issued to each man as part of their standard equipment. 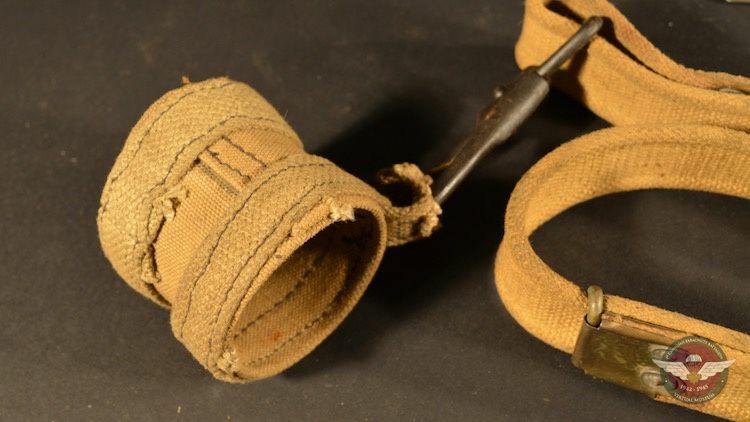 It had a loop at one end and wooden toggle at the other end as can be seen in the pictures. 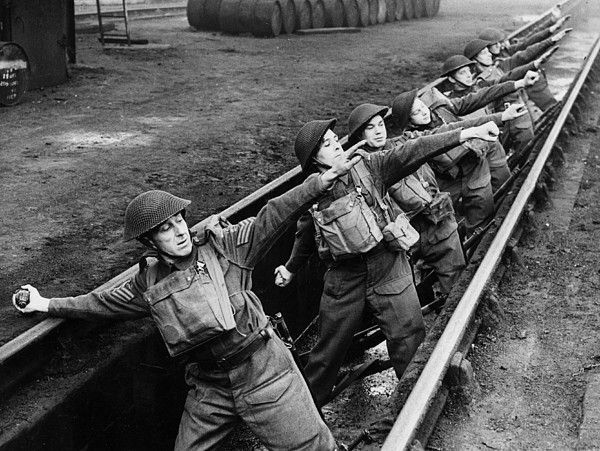 When many are linked together, they could be used to cross obstacles. 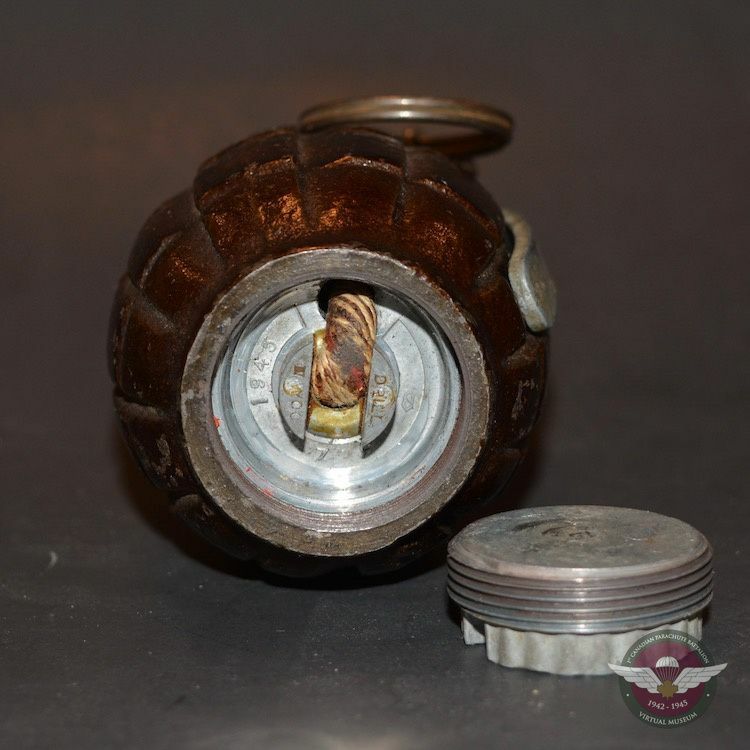 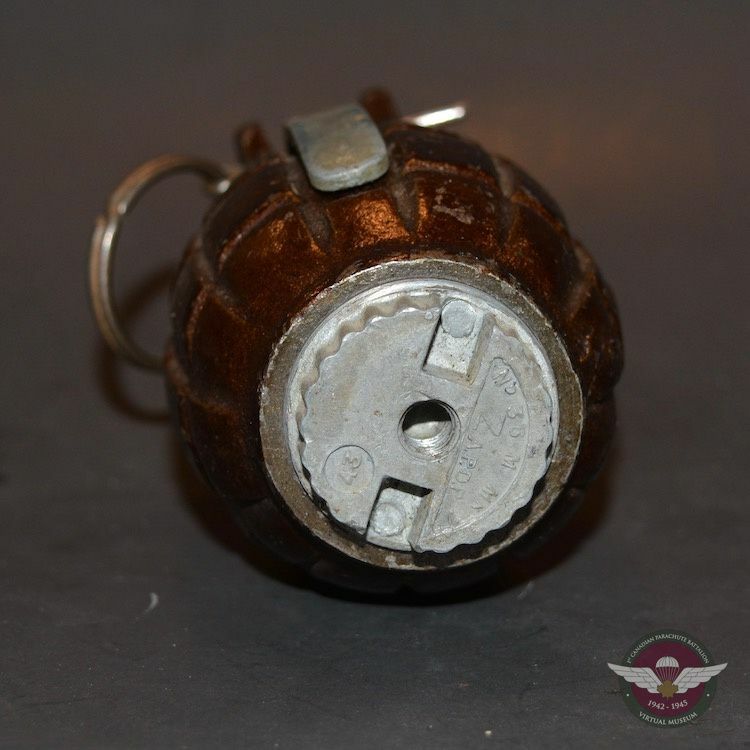 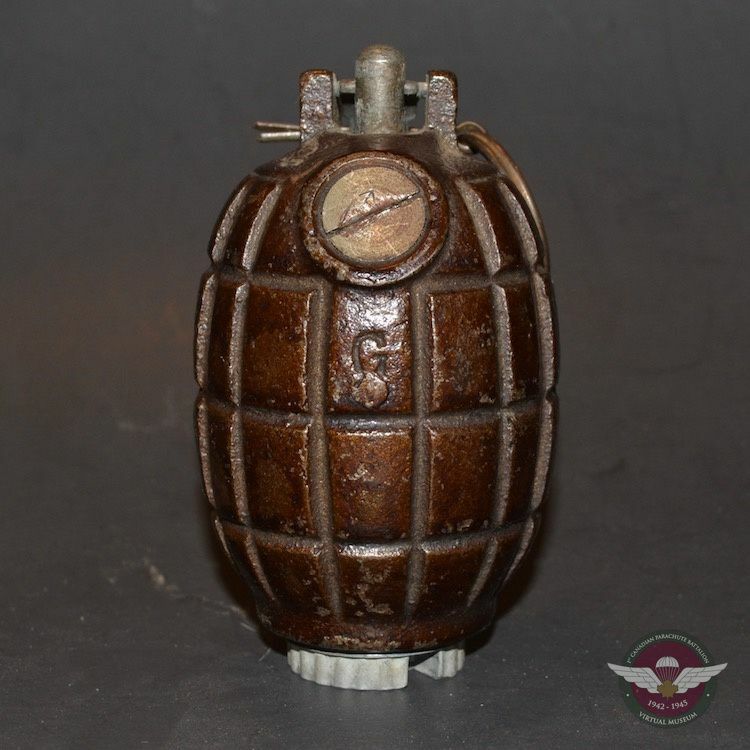 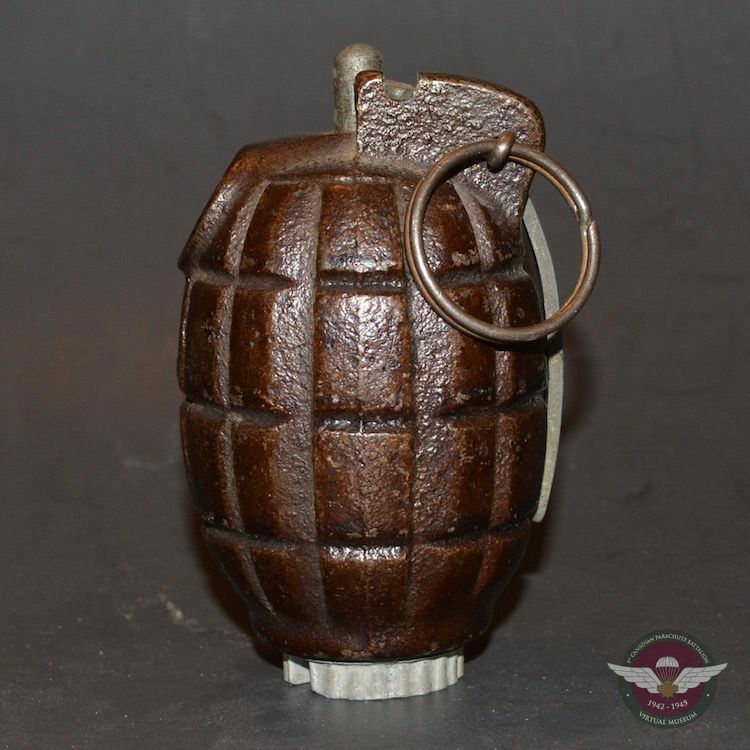 The M36 Hand Grenade, often referred to as a "Mills Bomb", weighing approximately 1 pound was standard issue to ground troops. 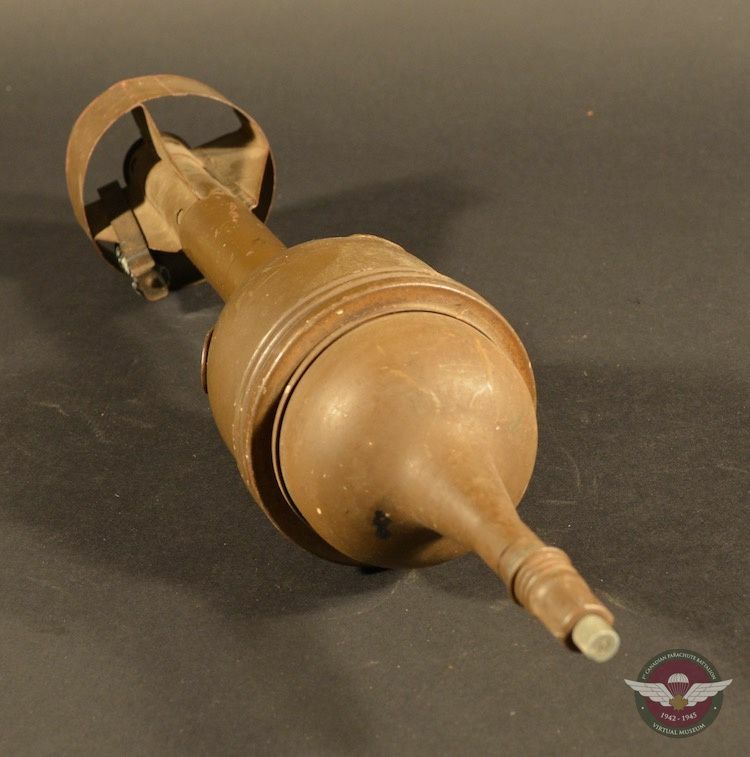 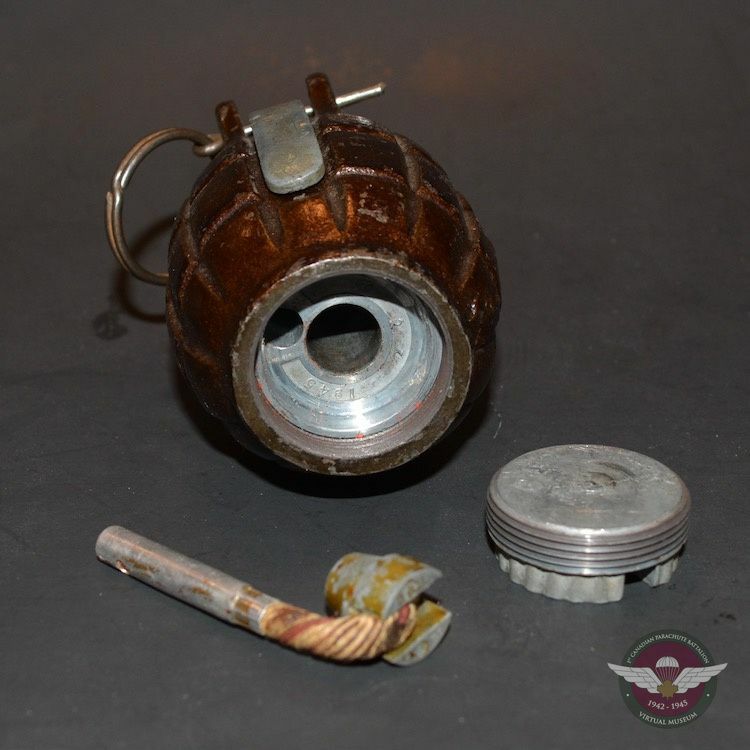 These hand grenades could be thrown or launched from a discharging cup device attached to the muzzle of the rifle and fired using blank ammunition in order to increase the distance. 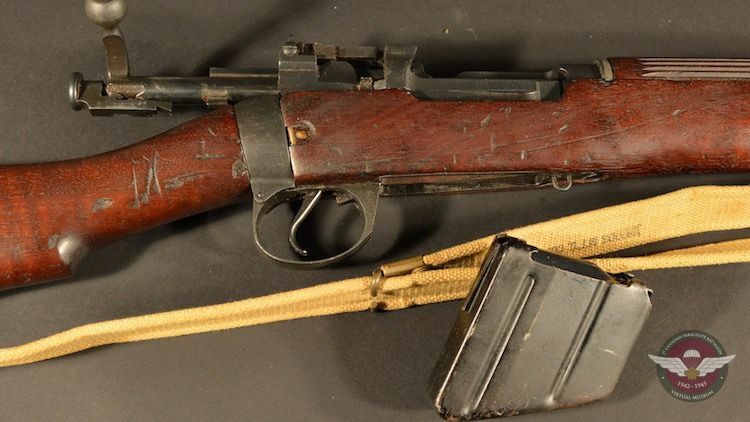 A large majority of ground troops were issued the Lee Enfield bolt action rifle. 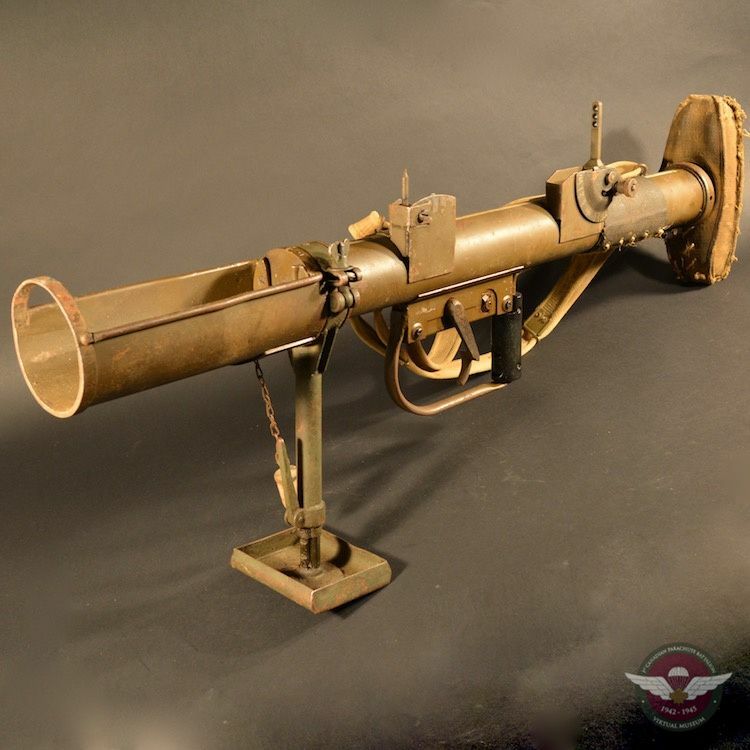 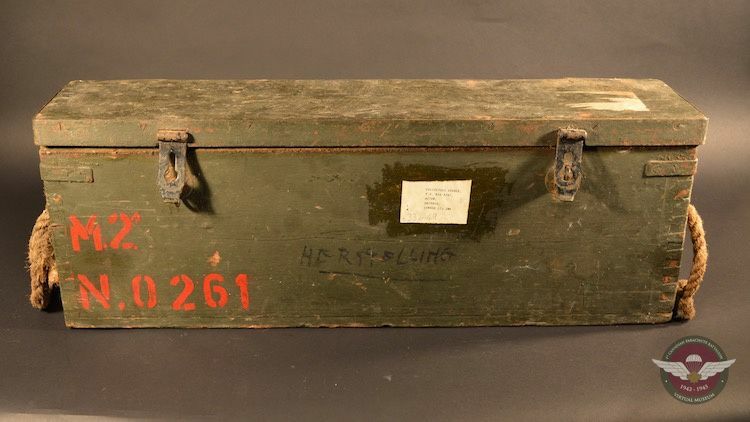 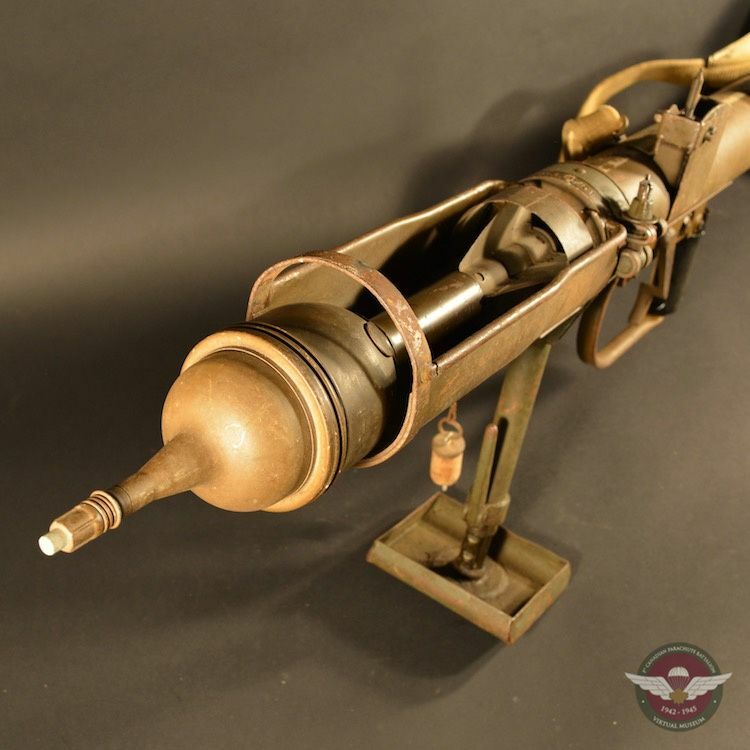 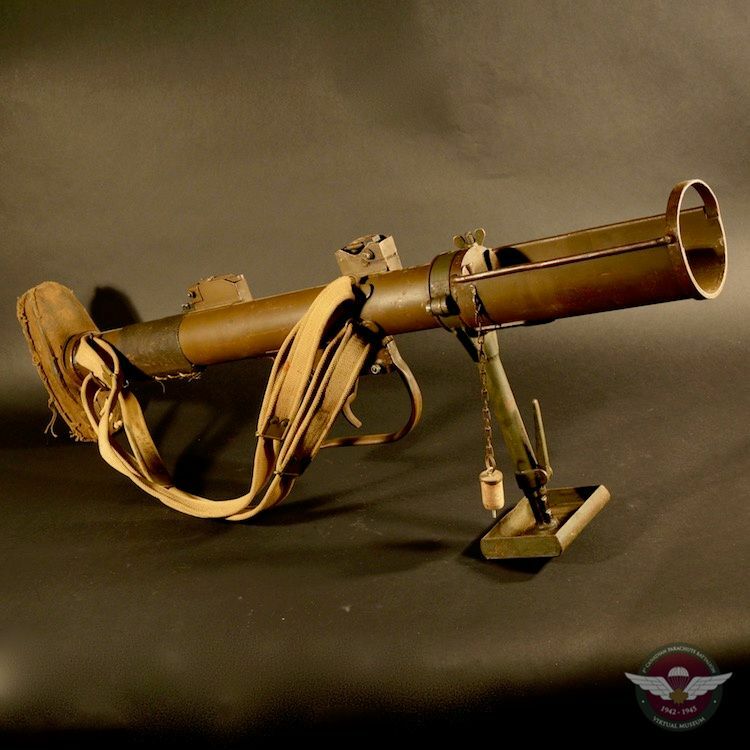 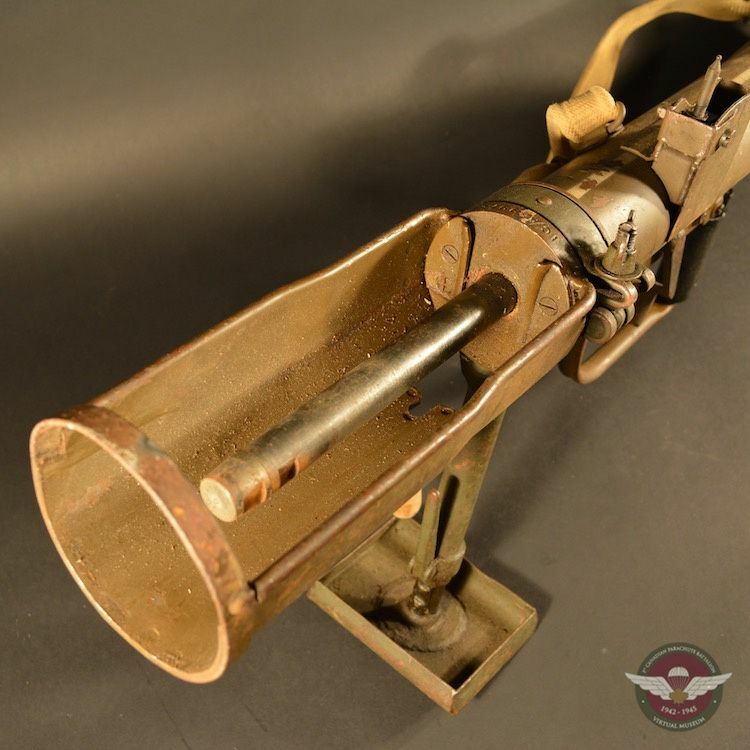 It weighed approximately 4 pounds, magazine fed 303 ammunition and depending on the skill of the soldier, the rate of fire would be between 20 – 30 rounds per minute. 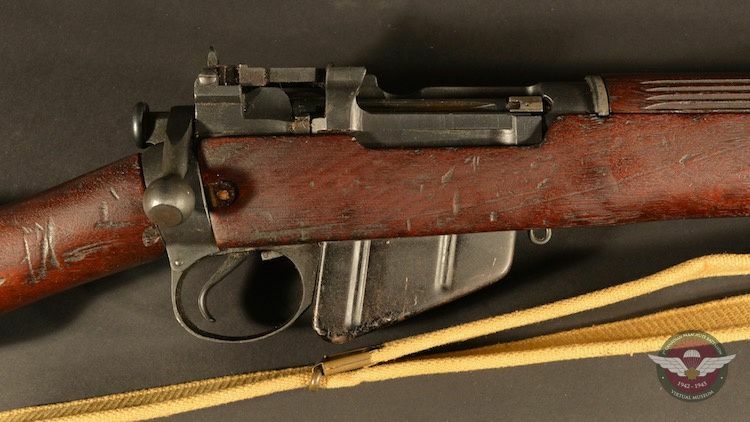 Courtesy of Collectors Source. 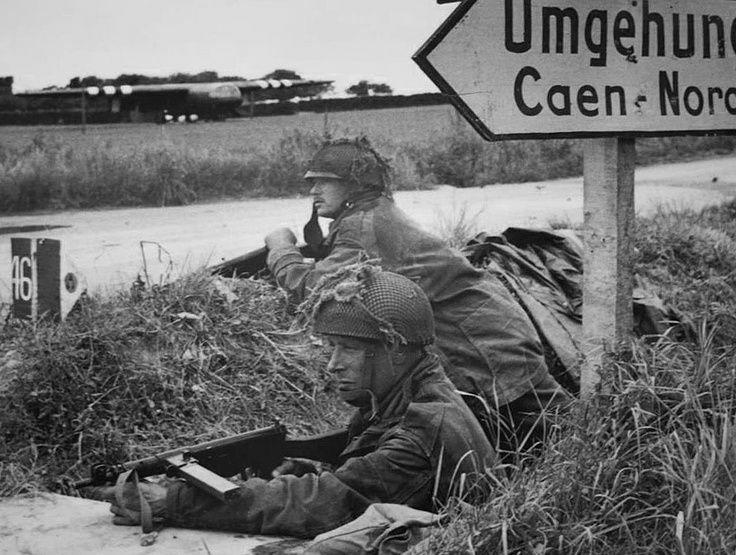 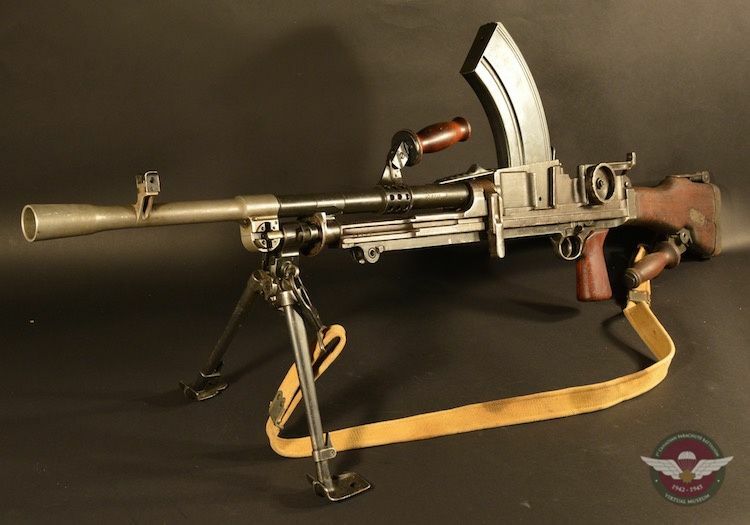 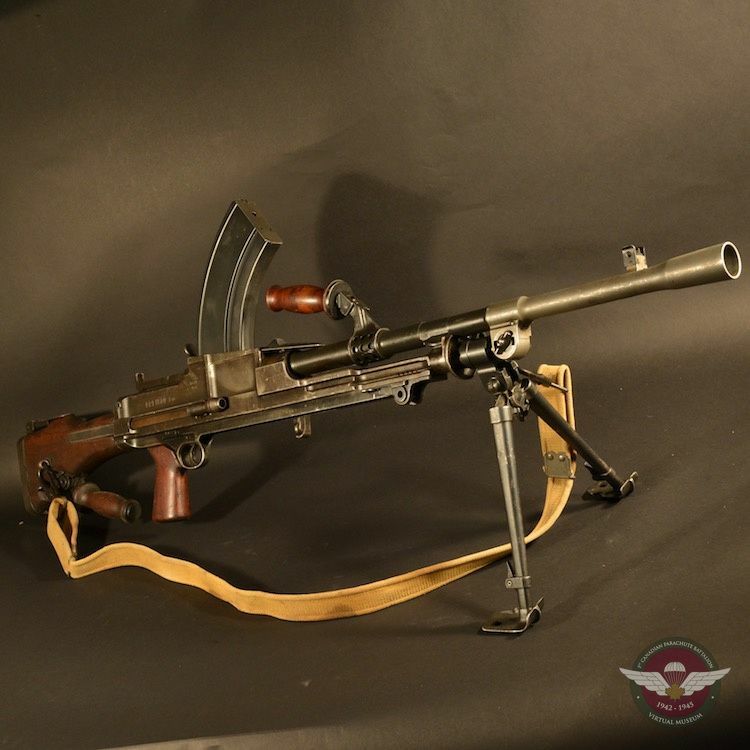 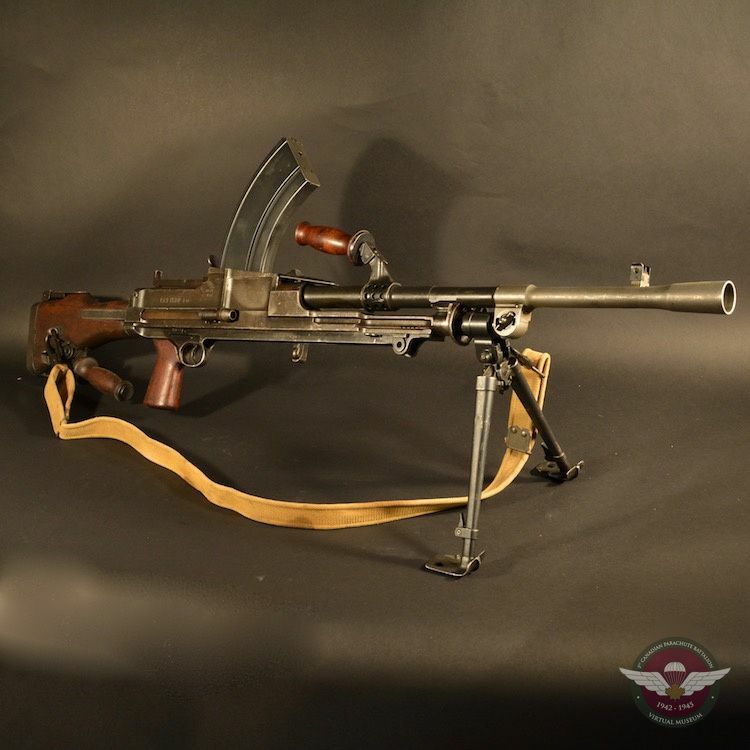 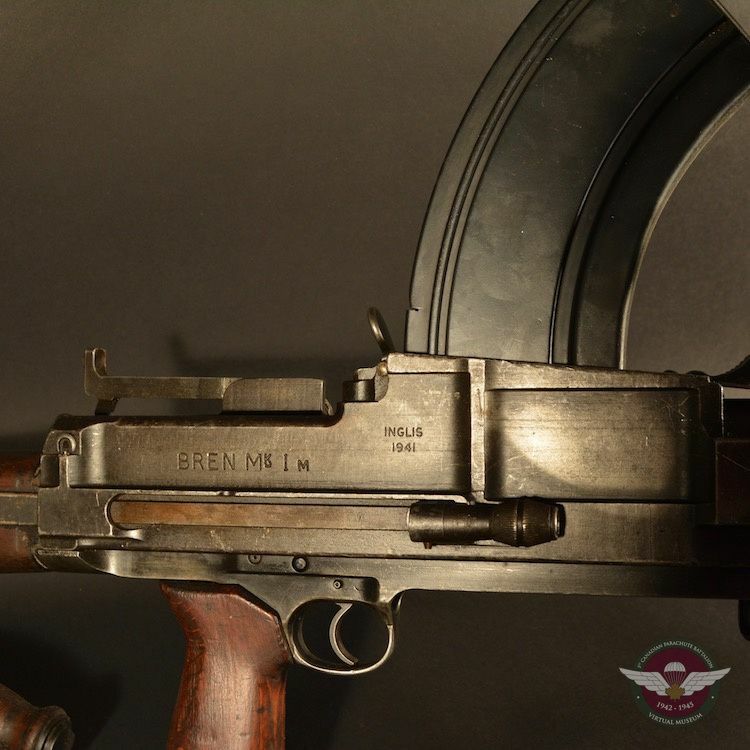 The Bren Light Machine Gun MK1 was often referred to as a Bren. 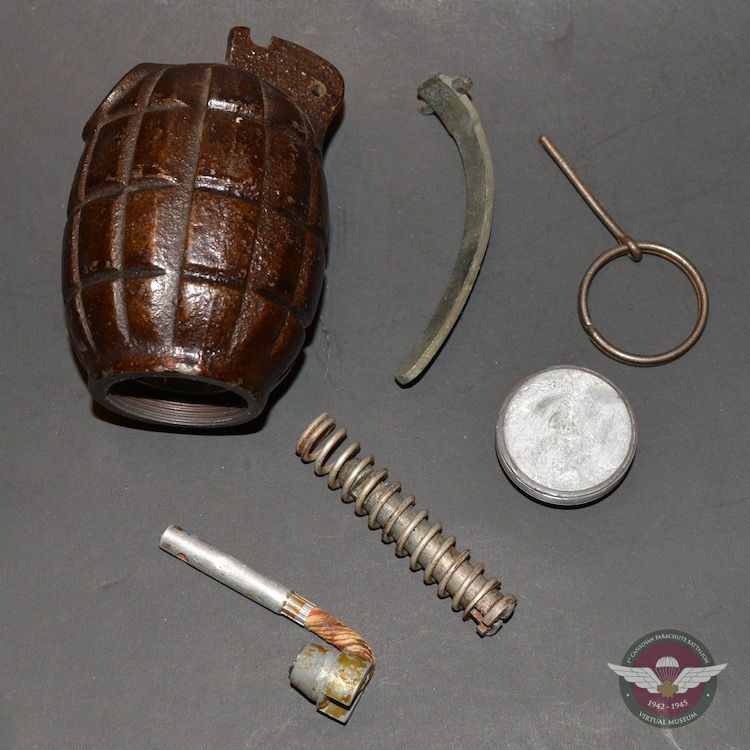 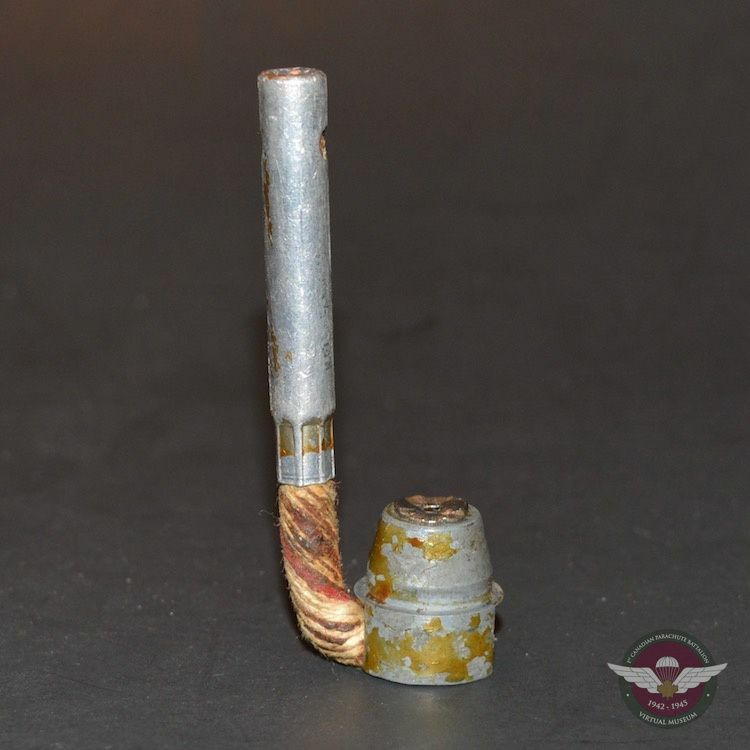 It was magazine fed 303 ammunition and primarily used in a two-man team. 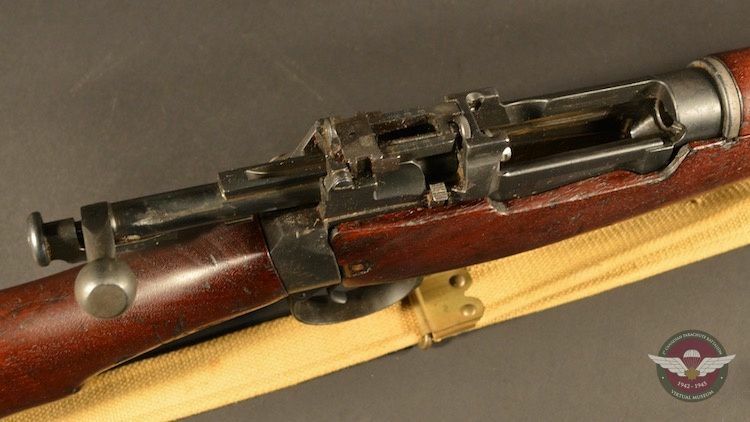 The second member of the team would carry an extra barrel and additional 30 round magazines. 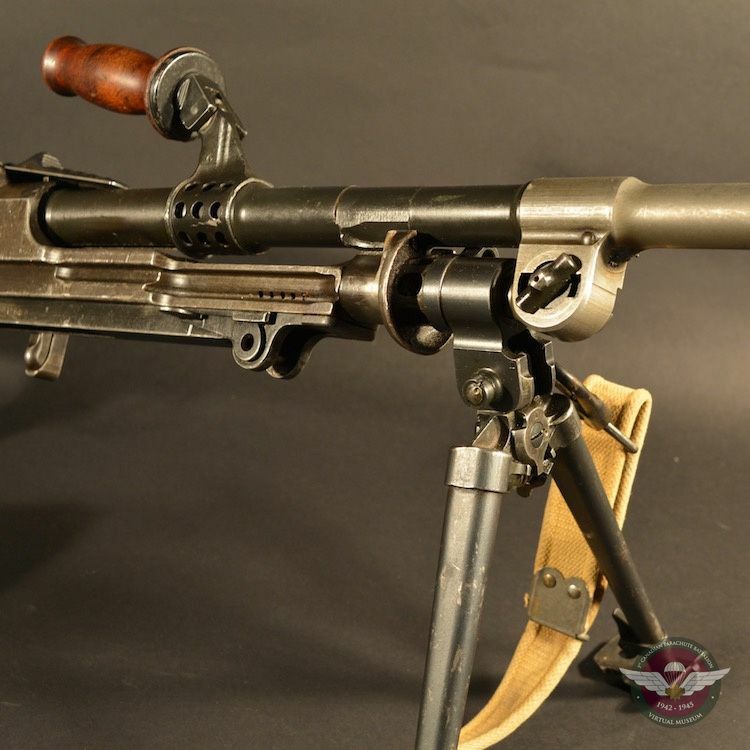 It weighed approximately 25 pounds and had a rate of 500 rounds per minute with an effective range of 600 yards. 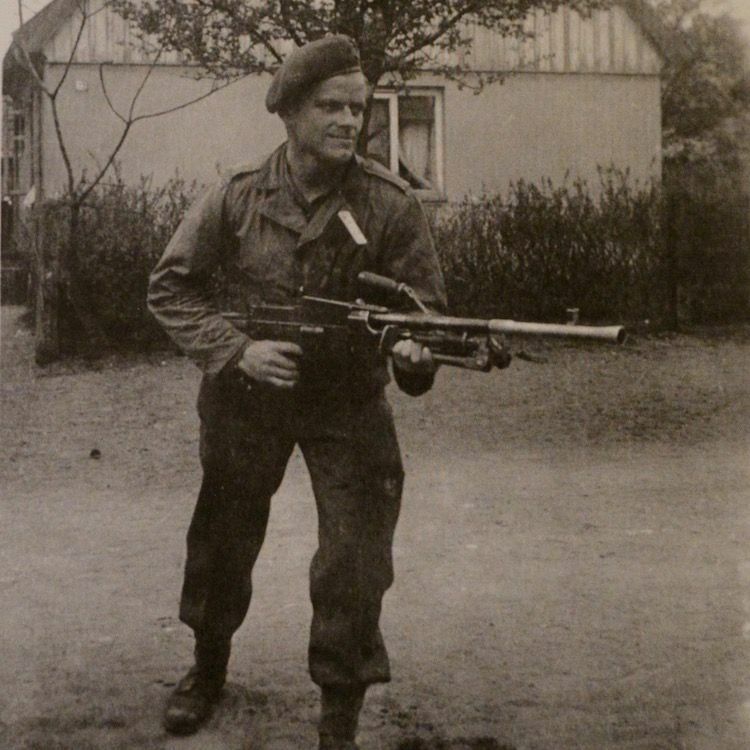 When the action began, the Bren was every soldier's best friend. 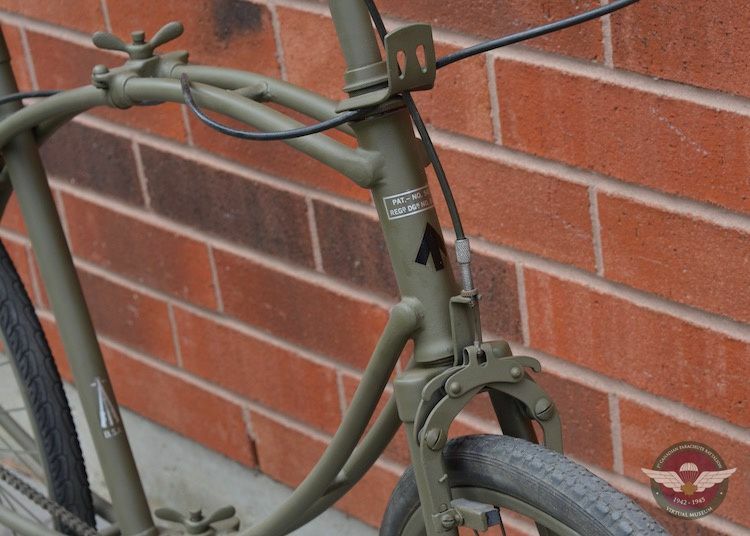 Courtesy of Collectors Source. 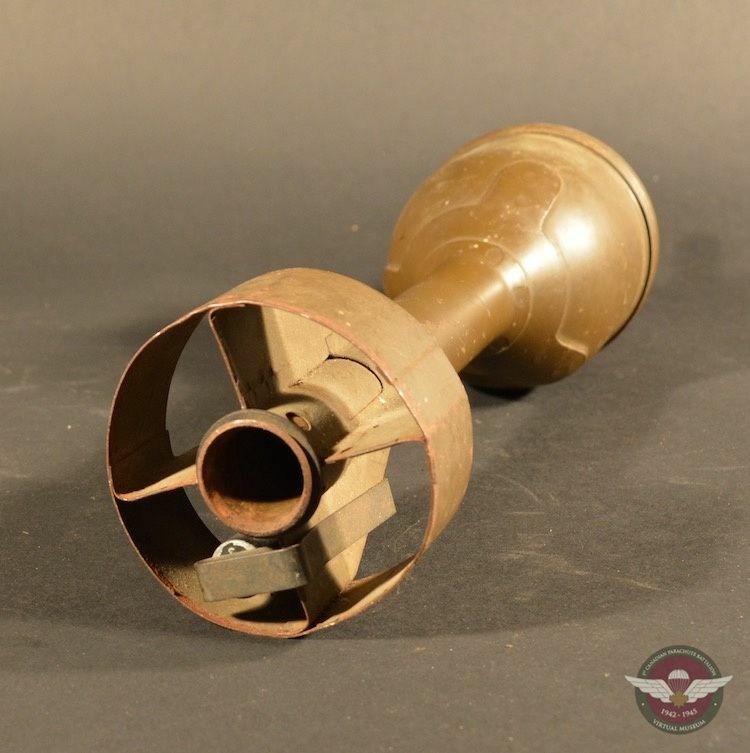 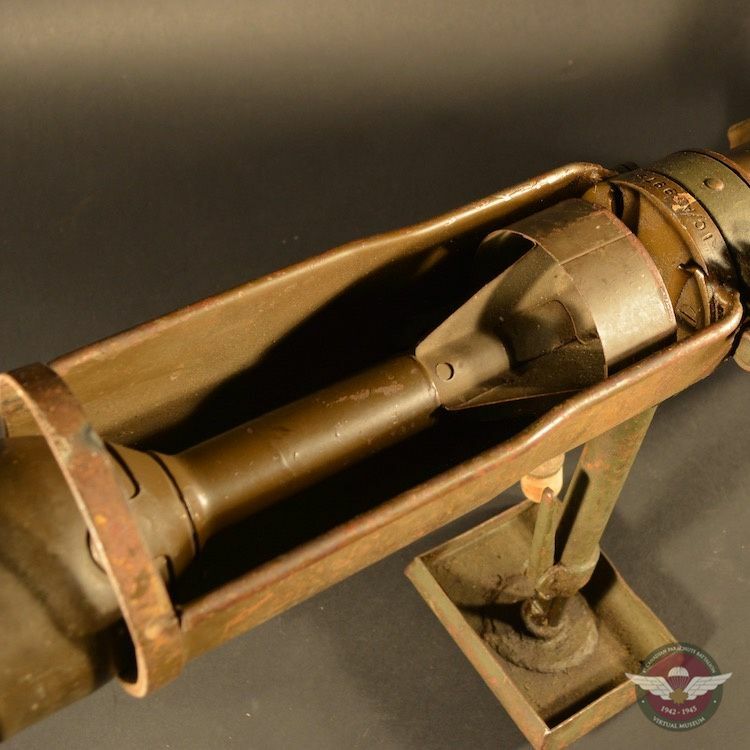 The 2” Mortar was referred to as the light mortar as it was compact enough for ground troops to transport and use. 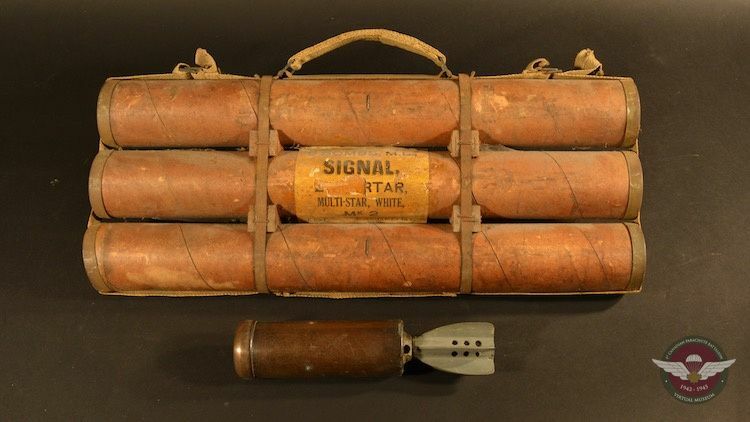 The mortar itself weighed approximately 10 pounds and there were many variants of this weapon system. 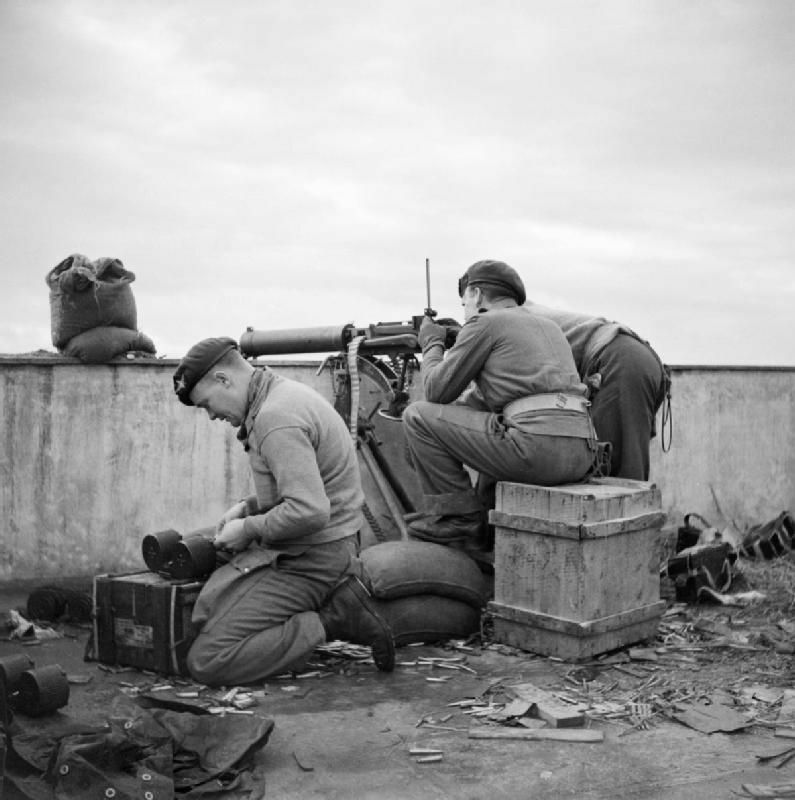 A well trained two-man crew could fire 8 rounds per minute with an effective range of 500 yards. 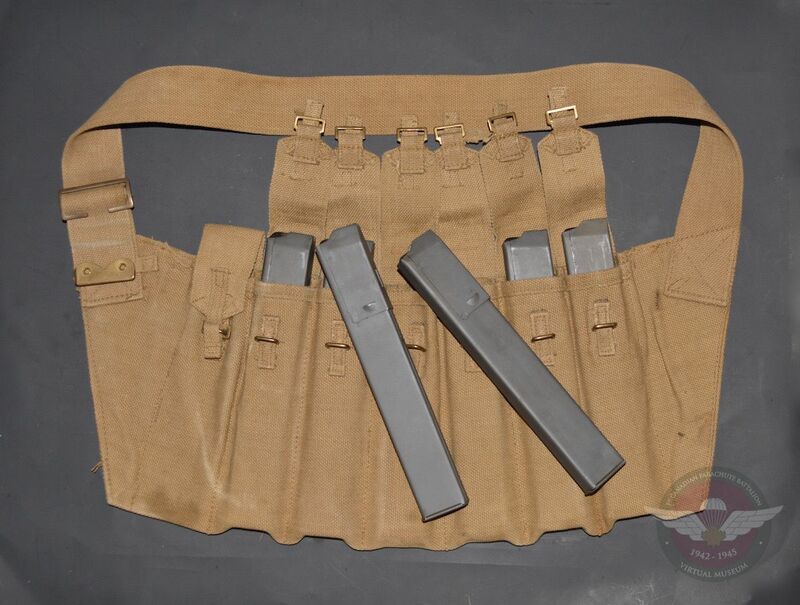 It could be used with a selection of ammunition such as High Explosive, Smoke and Illuminating rounds depending on your application needs. 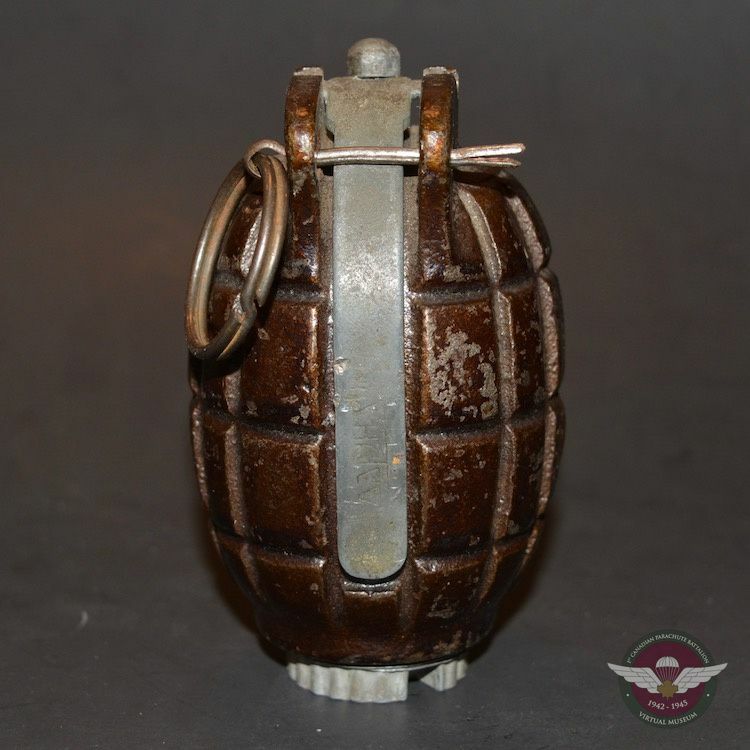 Each round weighed roughly 2 pounds. 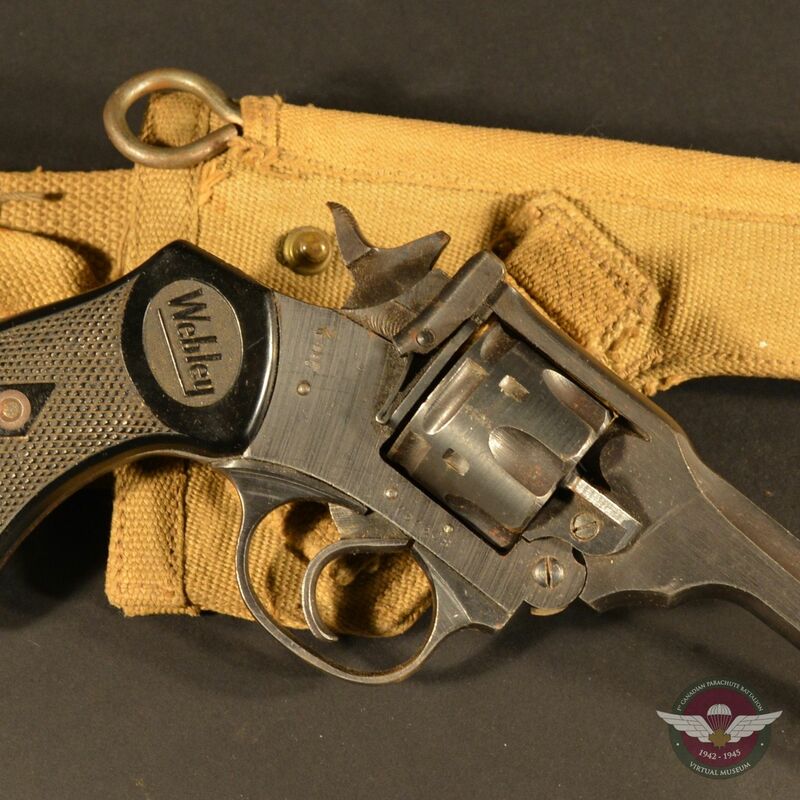 Courtesy of Collectors Source. 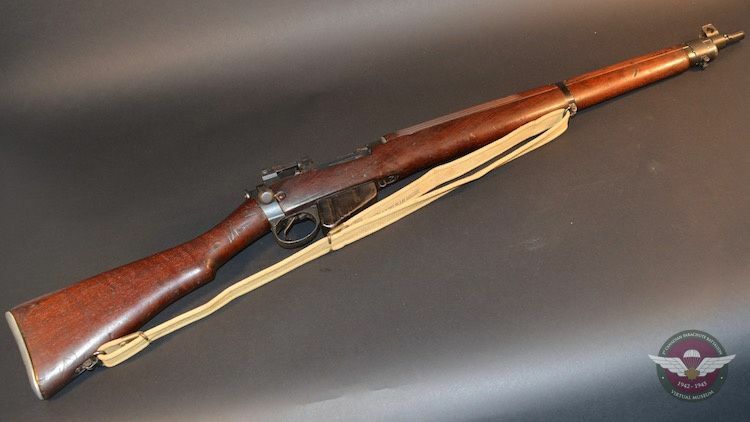 The Lee Enfield Mk1 Sniper Rifle was a better quality 303 rifle with scope to allow a soldier to reach the enemy at greater distance. 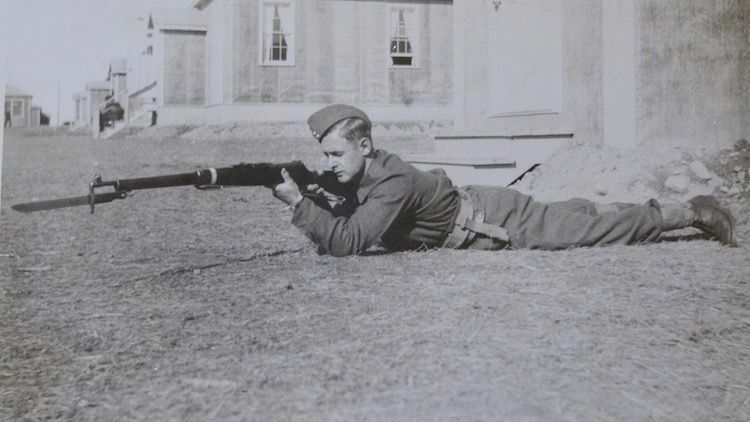 The men chosen to become snipers received special training in advanced shooting, patrolling and field craft making them a lethal addition to the Battalion. 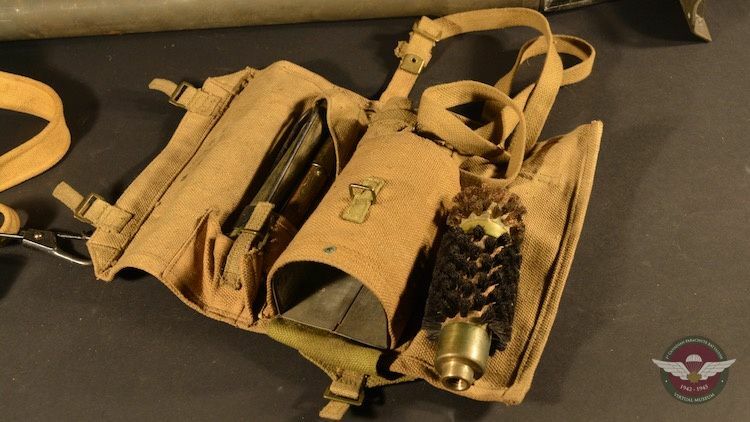 Courtesy of Collectors Source. 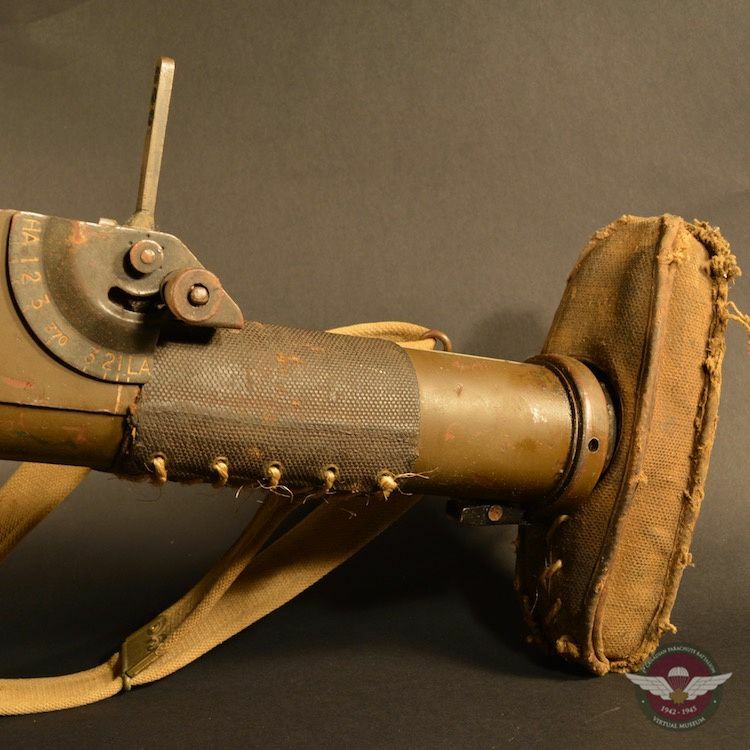 The Projector Infantry Anti Tank weapons system, often referred to as a PIAT was employed by ground troops in order to disable tanks and other armoured vehicles. 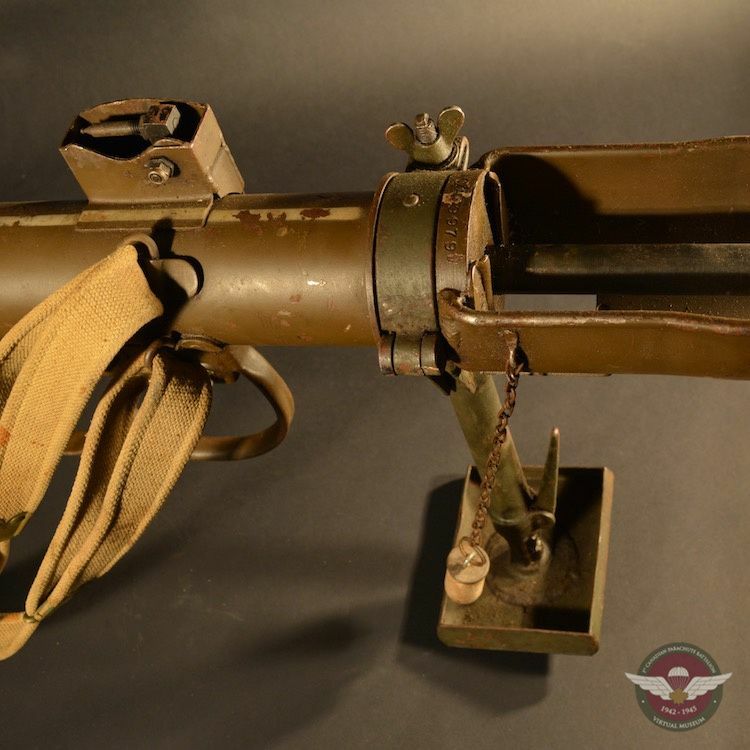 The effective range of the PIAT against a tank was 115 yards, which meant you required nerves of steel to allow a tank to get close enough before engaging. 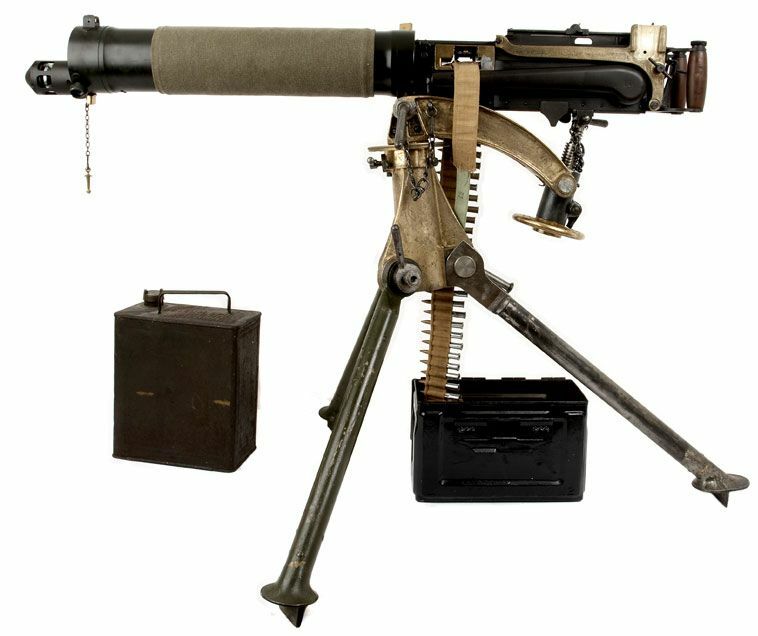 The PIAT could also be used for breaching buildings, which allowed for a greater distance, up to 350 yards and still be effective. 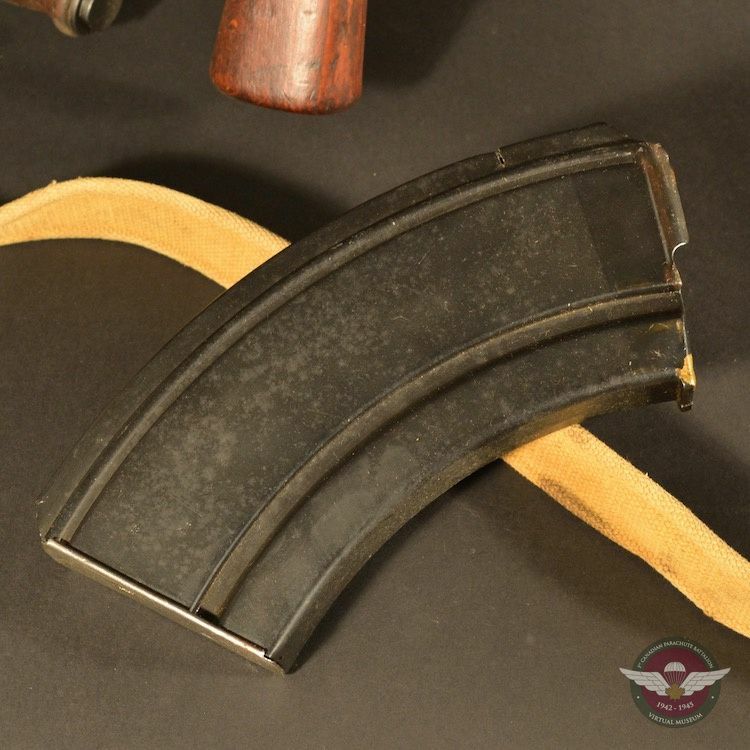 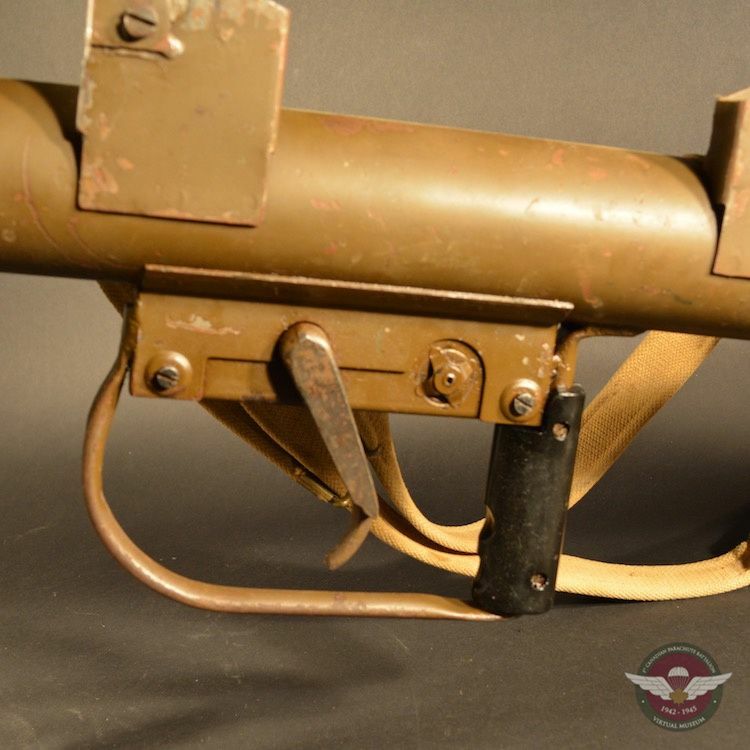 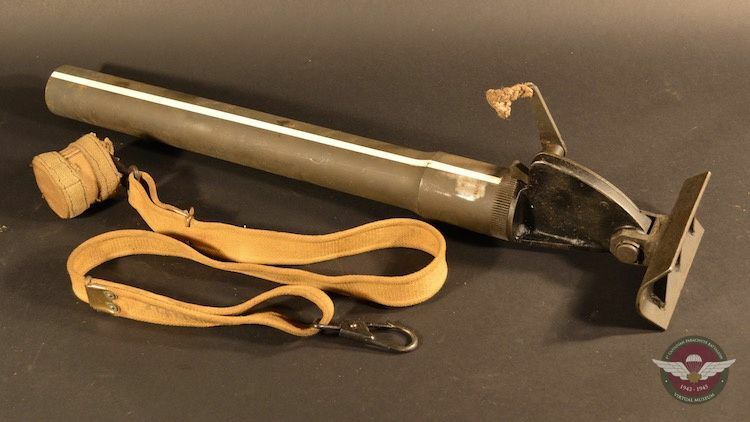 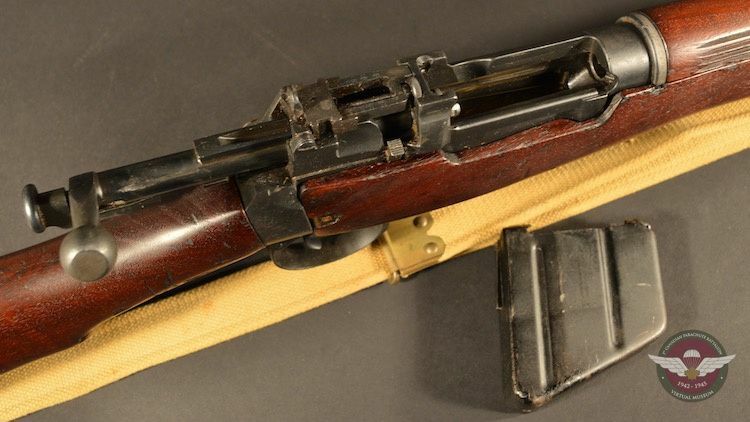 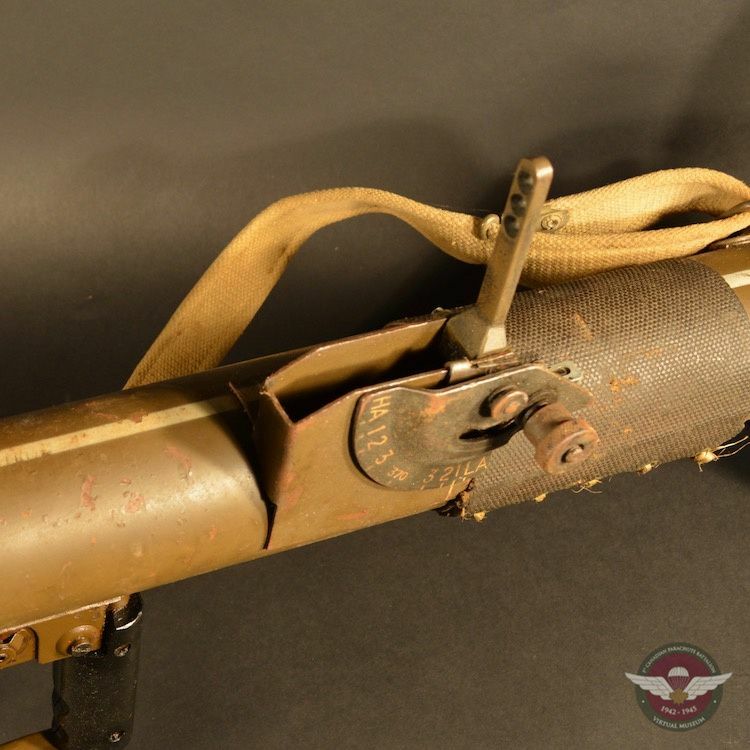 The PIAT itself weighed 32 pounds and a bomb weighed approximately 2.5 pounds, being carried in a container of 3 rounds. 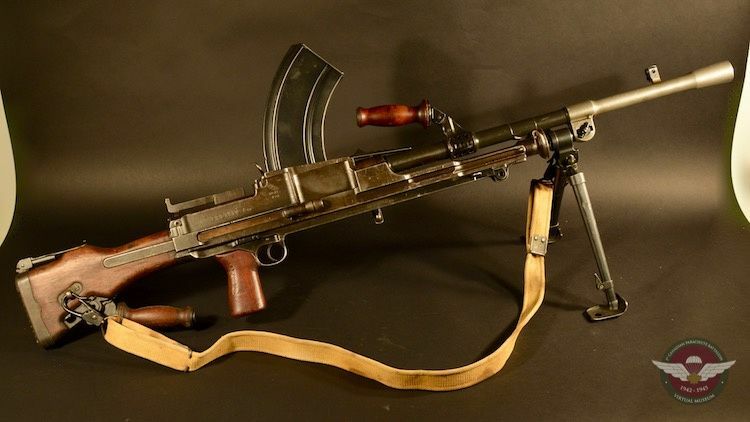 The PIAT was heavy and cumbersome to carry around. 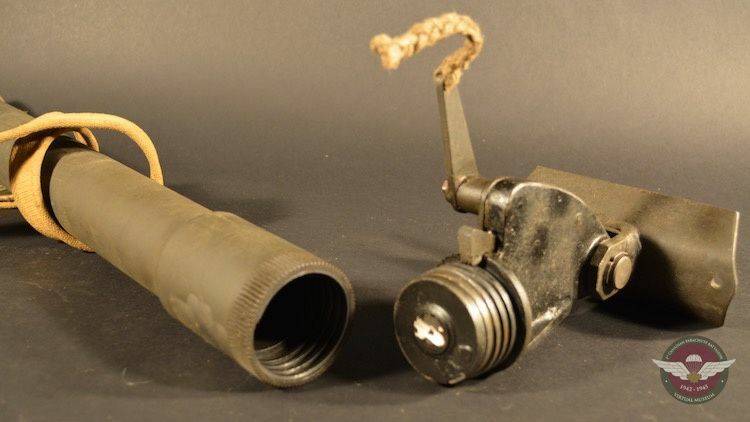 It was also challenging to prepare for loading, making the rate of fire less than desirable. 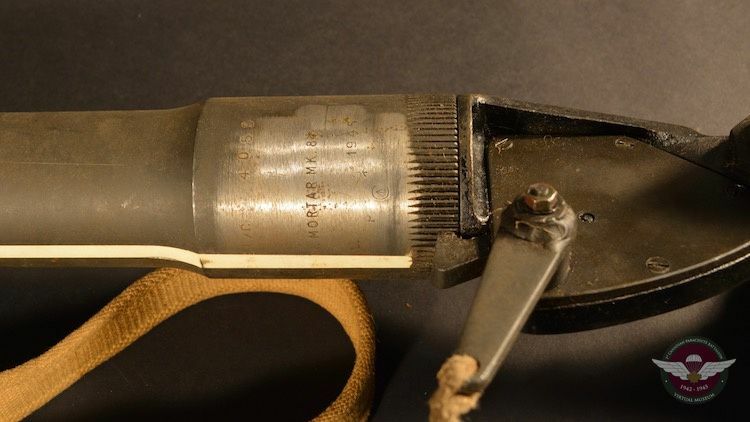 Courtesy of Collectors Source. 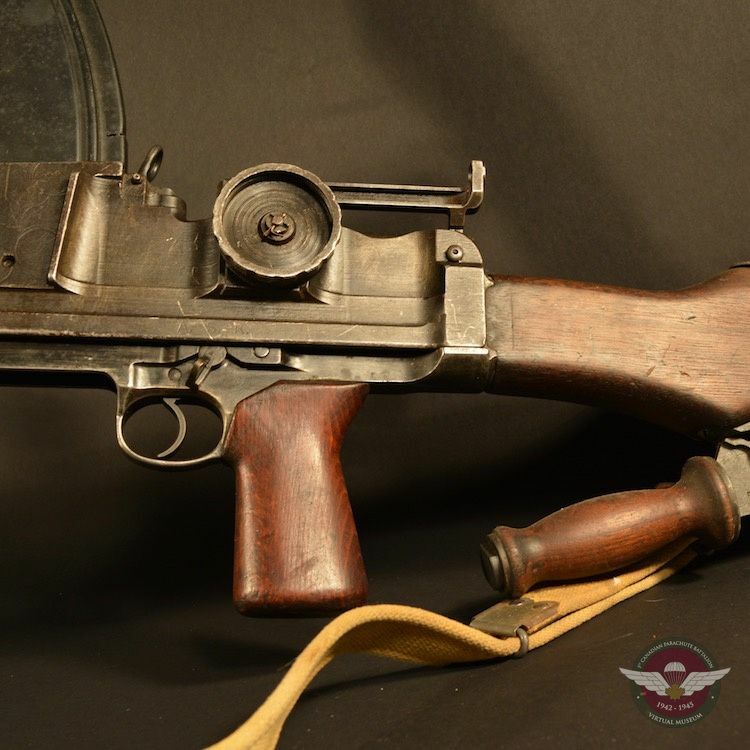 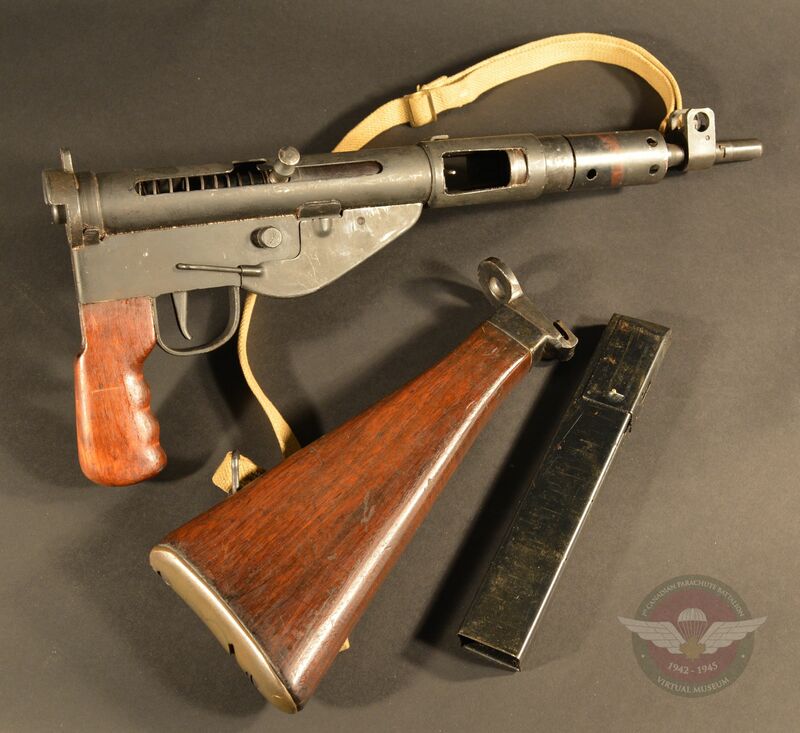 The Sten submachine gun can be found in several models, the one pictured here is a Sten MKV, produced for the Paratroopers. 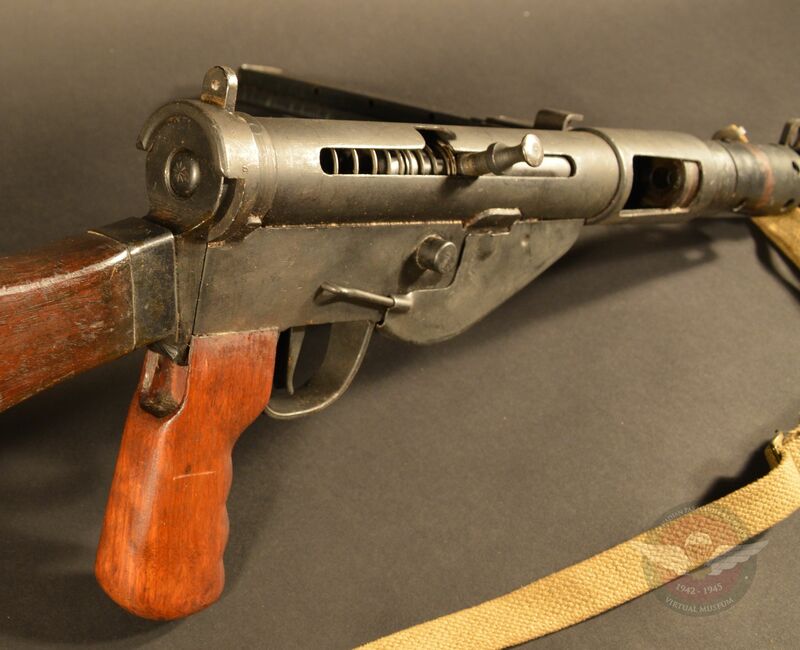 It was an inexpensive firearm to produce, costing less than $10.00 per unit. 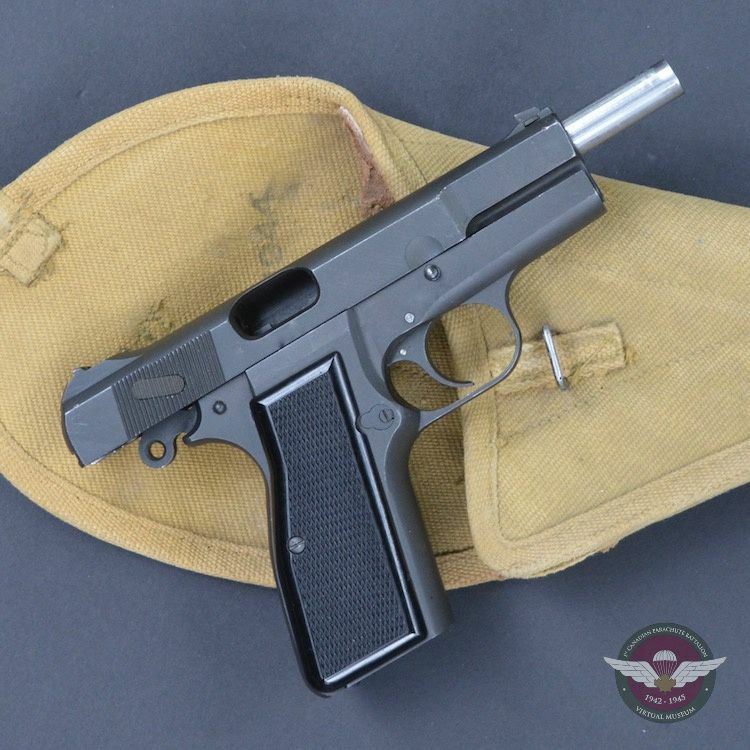 It chambered a 9mm cartridge with a firing rate 550 rounds per minute and an effective range of 100 yards. 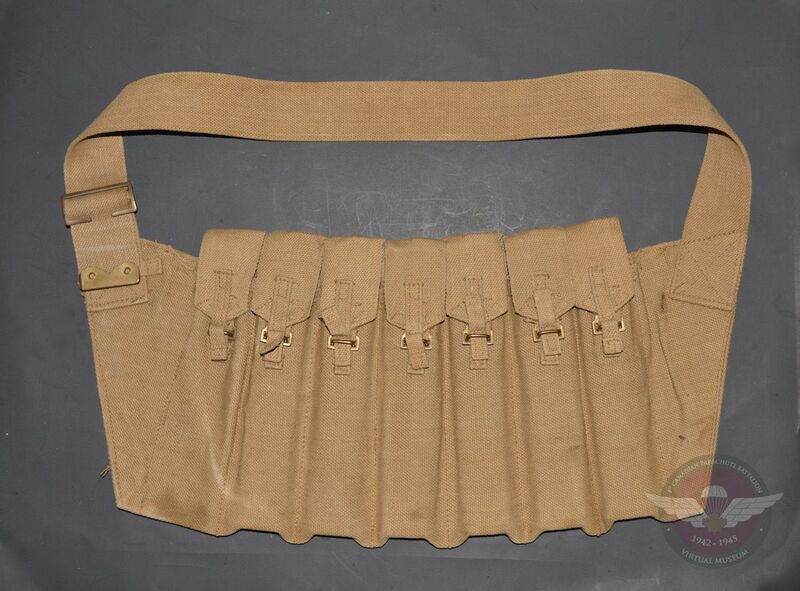 Also shown is a magazine pouch or bandolier that allowed a soldier to carry an additional 30 round magazines. 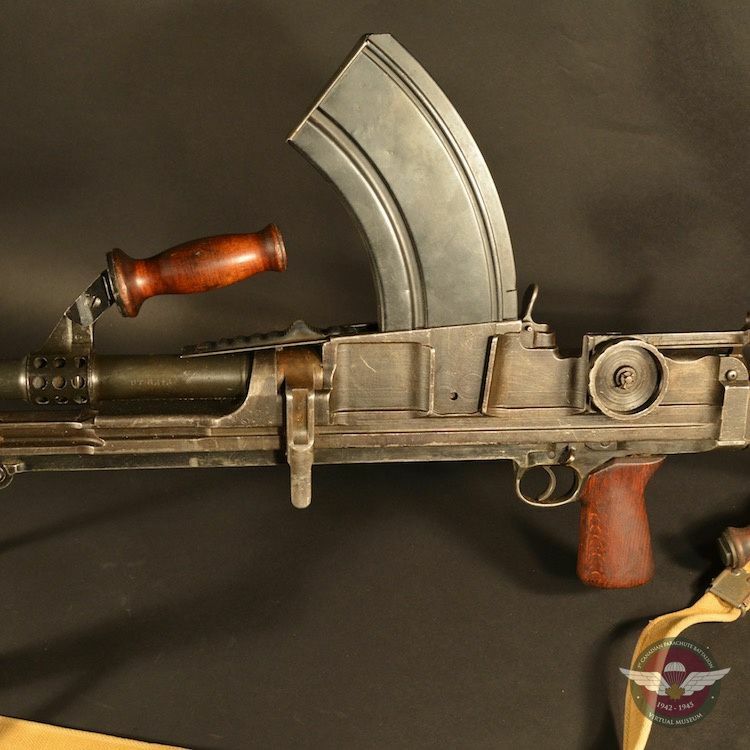 Courtesy of Collectors Source. 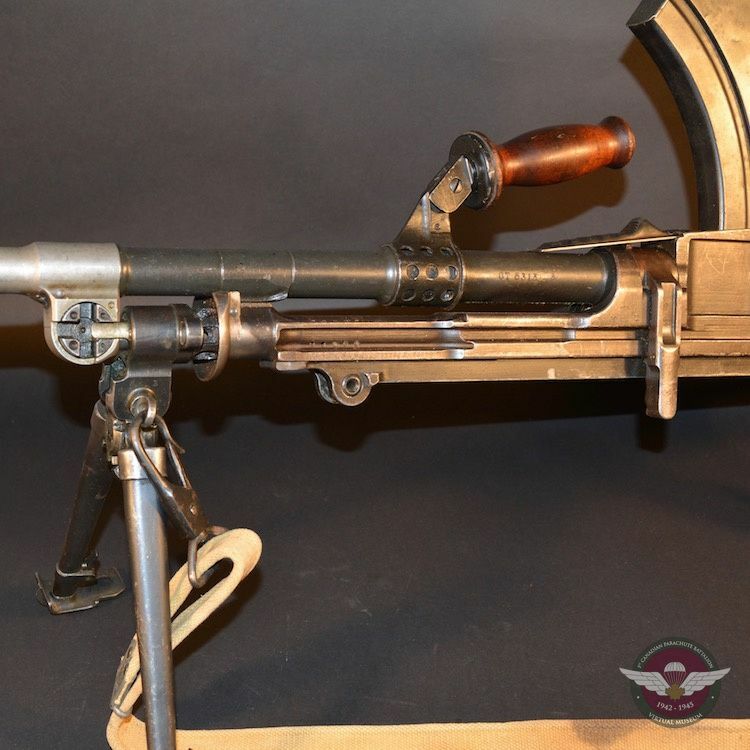 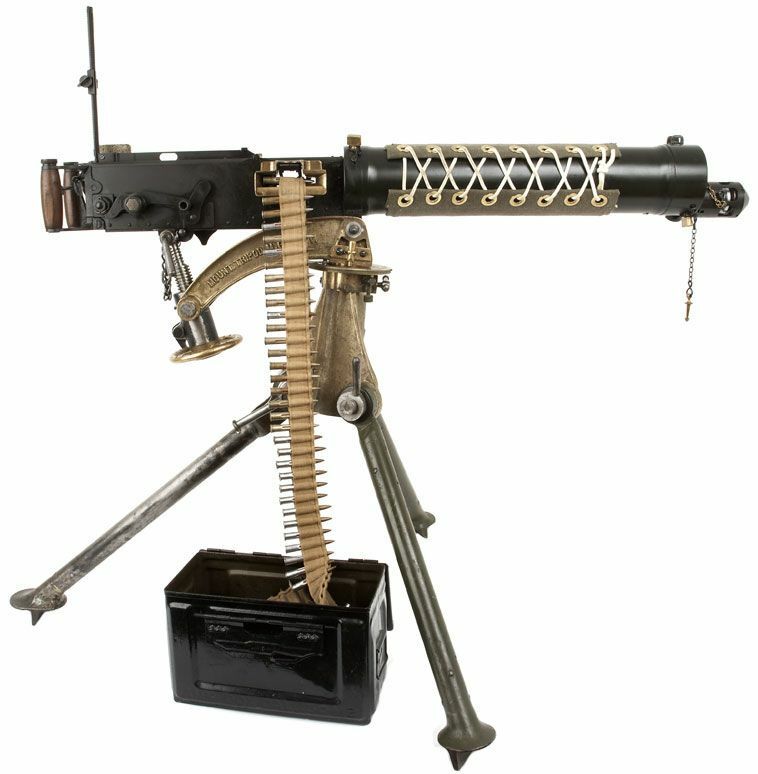 The Vickers Machine Gun has been in service since prior to World War 1, and continued its usage during World War 2. 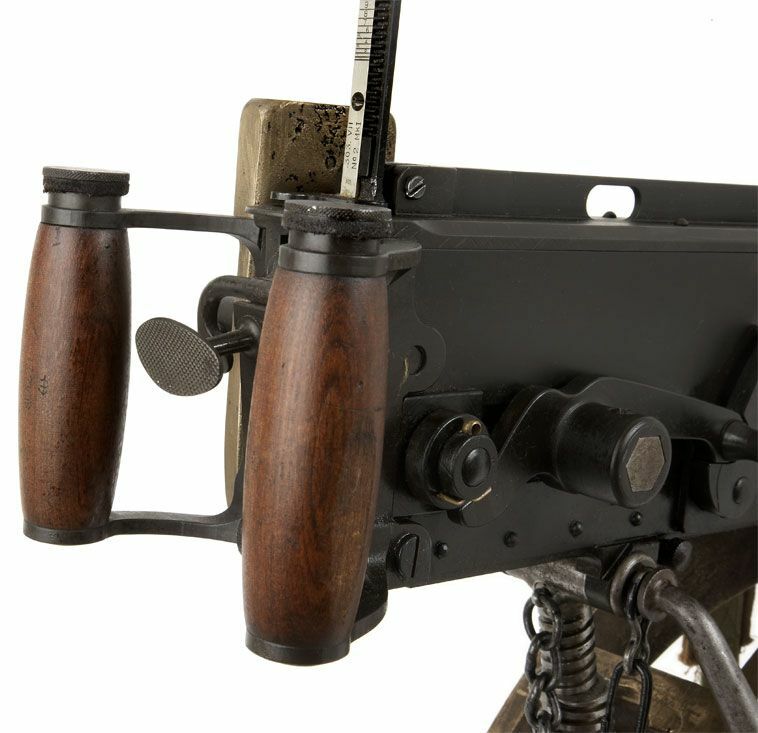 It chambered a British .303 cartridge and had a firing rate of 450 – 500 rounds per minute, with an effective range of 2,000 meters. 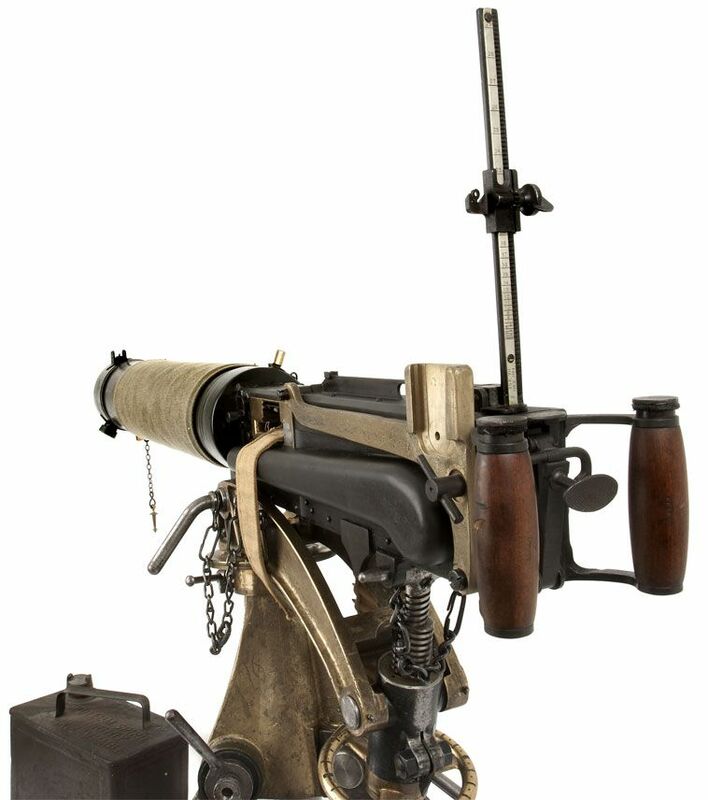 The Vickers Machine Gun was usually employed by a 3-man team in order to carry all the parts and ammunition required. 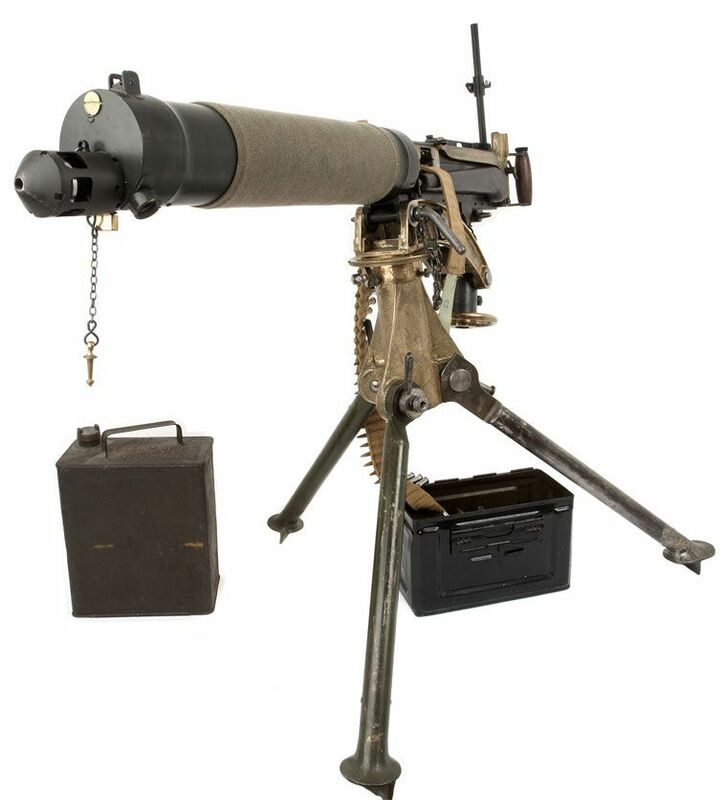 Due to it having such a long range, it was employed to support the platoon at a greater distance from the enemy. 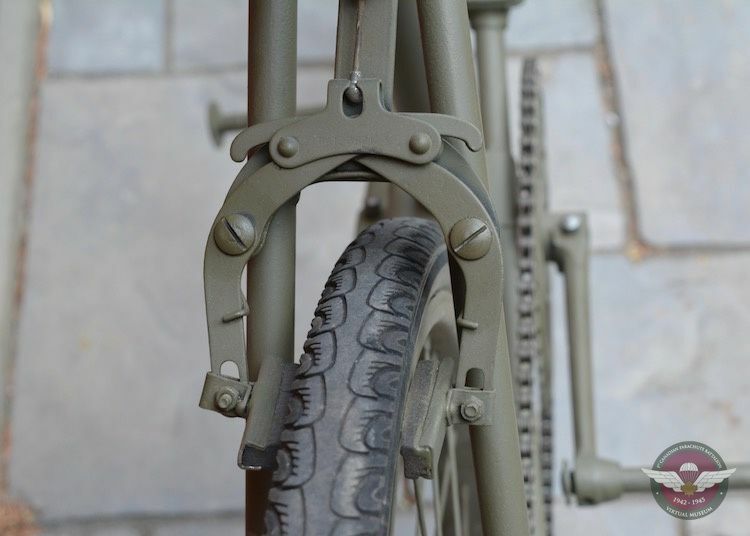 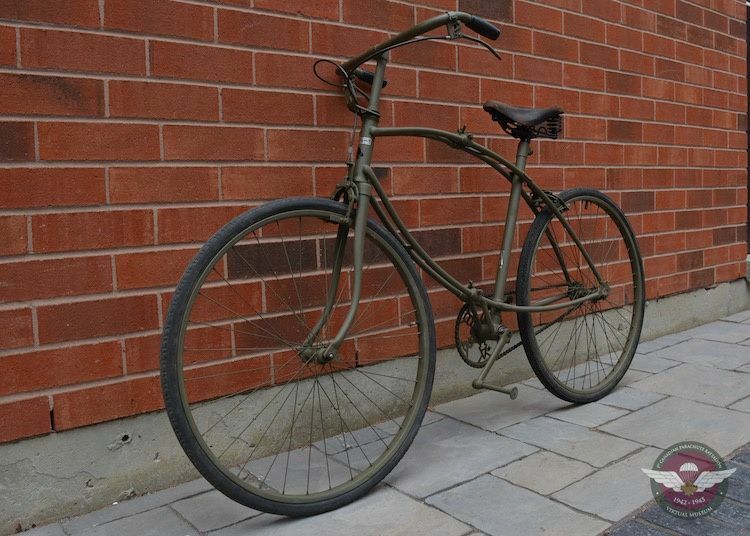 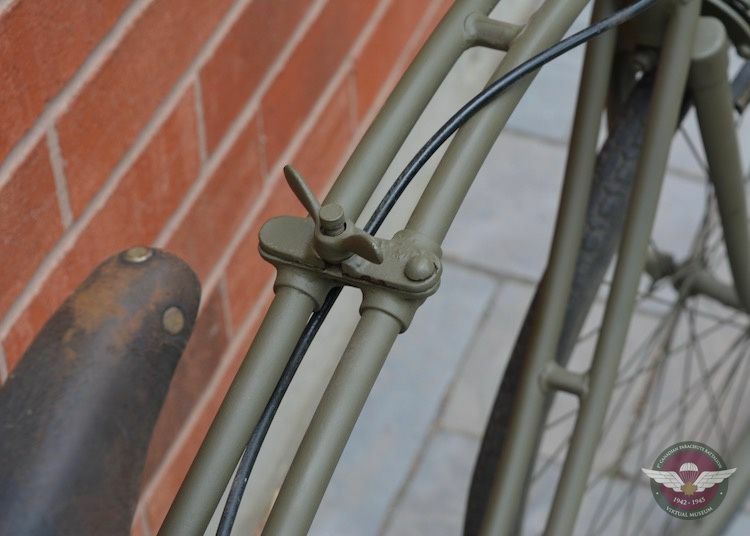 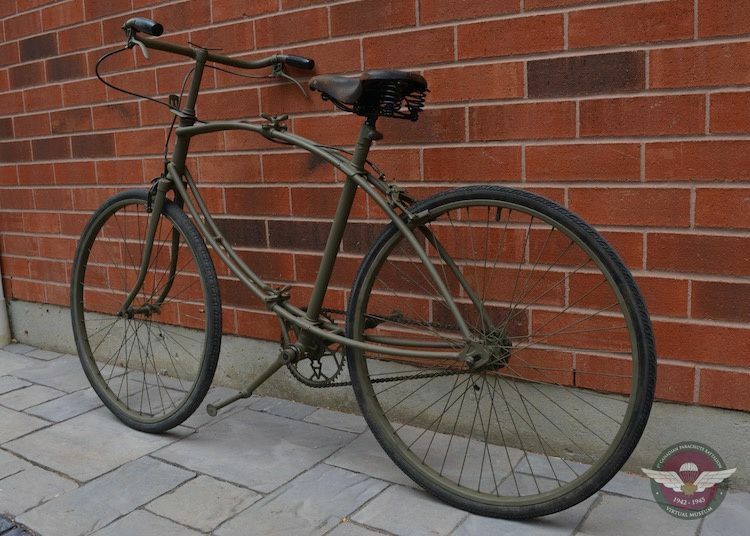 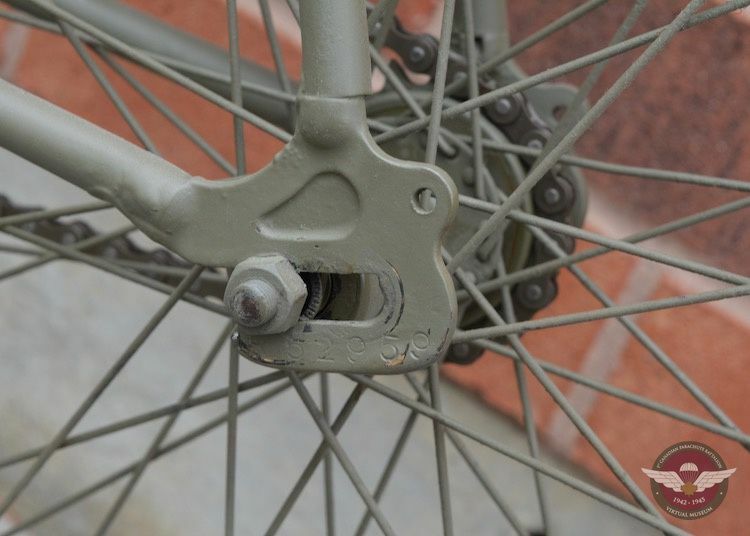 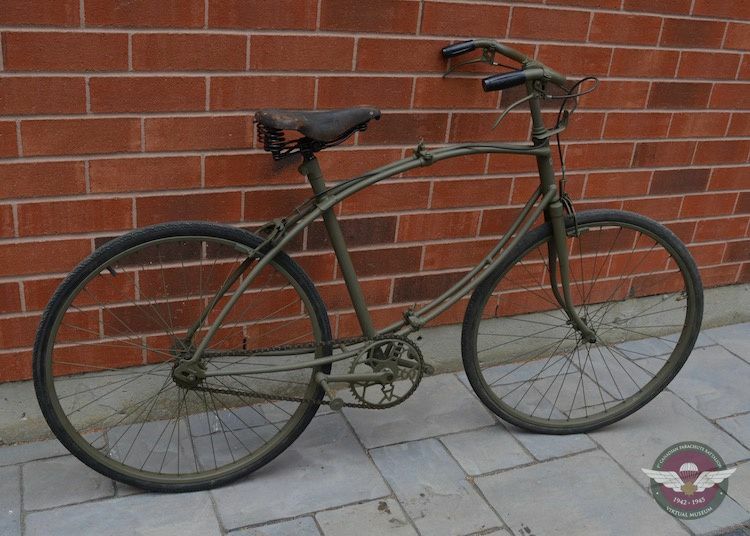 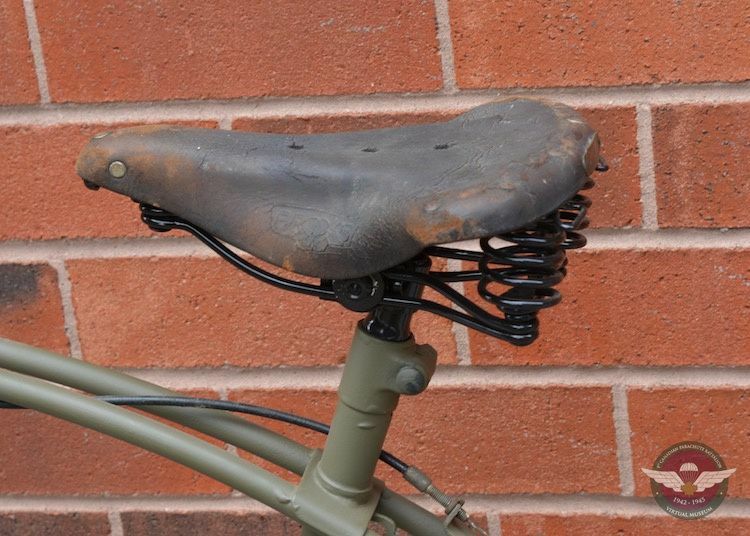 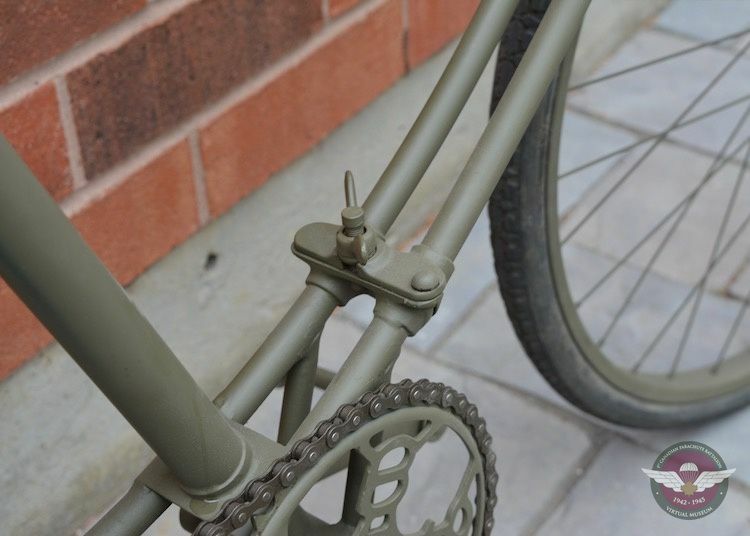 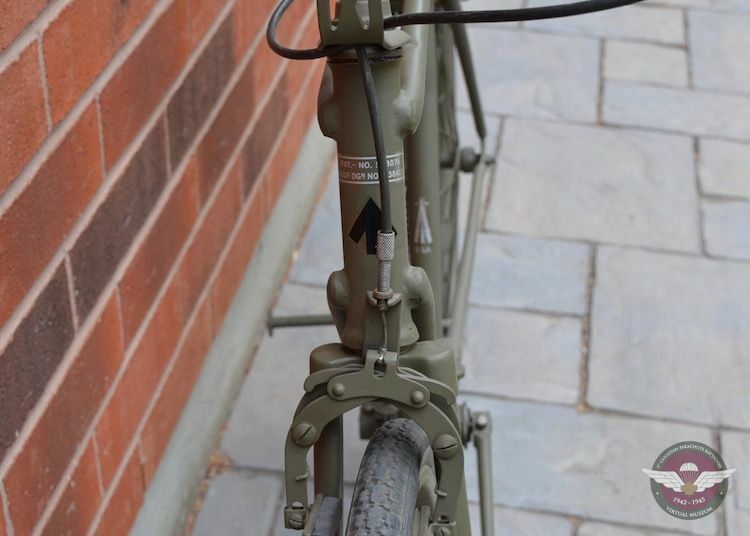 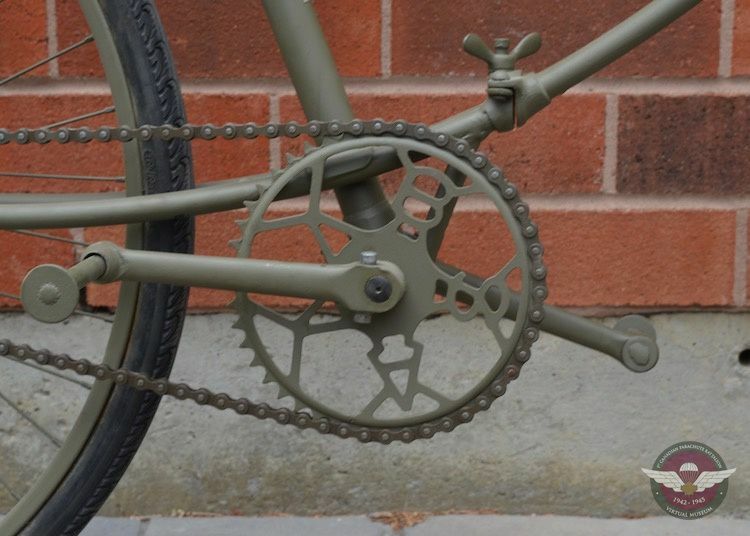 Photographs courtesy of Arundel Militaria in the U.K.
World War II 2nd pattern folding Airborne Bicycle produced by BSA.